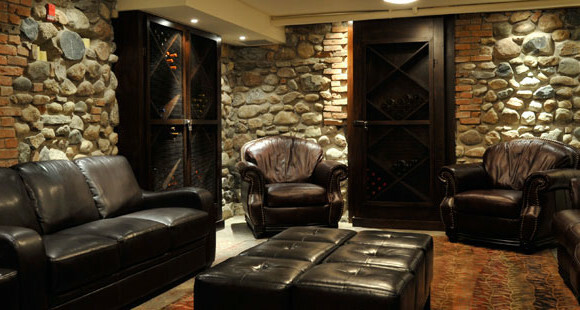 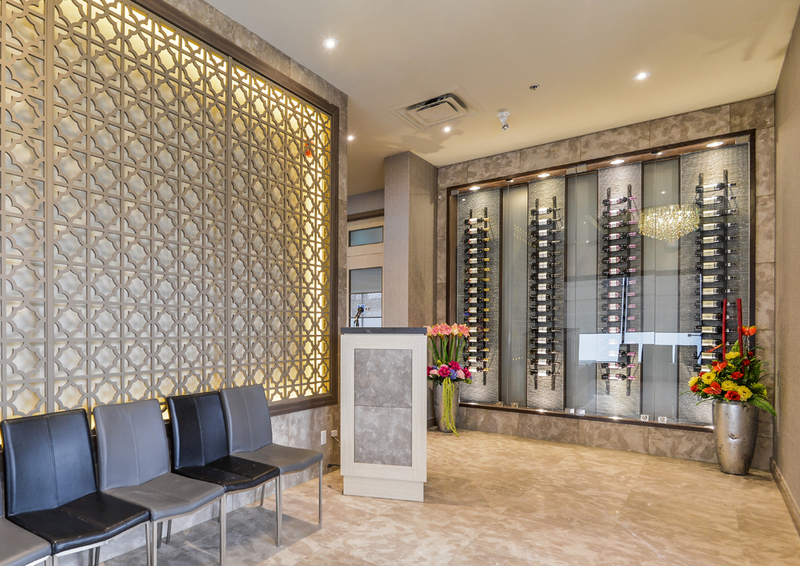 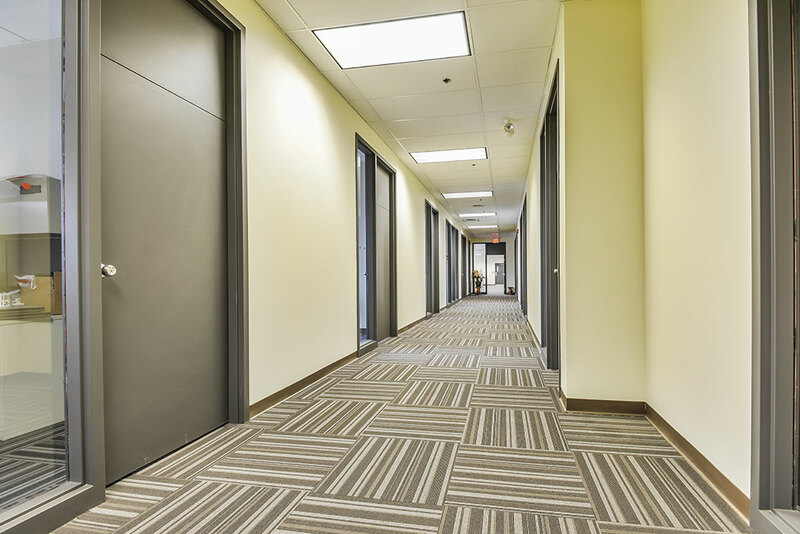 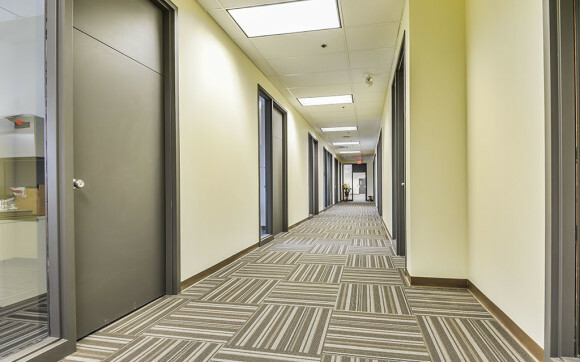 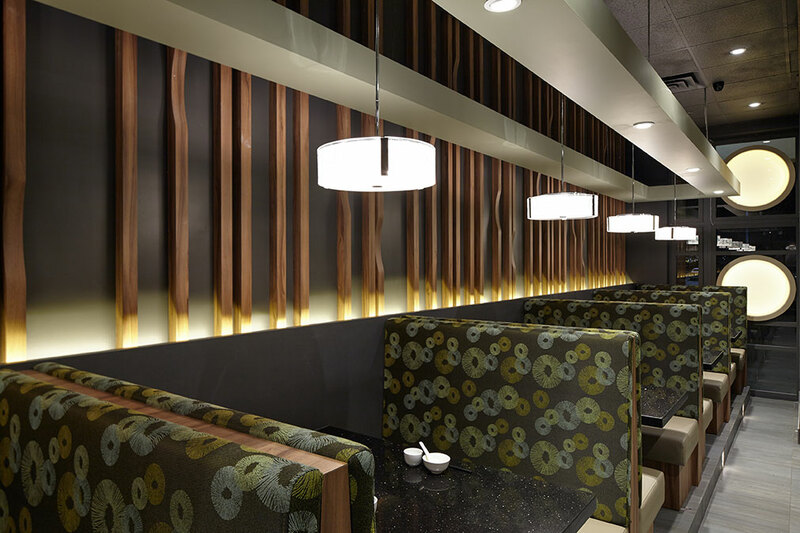 Interior Resources Associates Inc. is a multi-discipline, award-winning commercial interior design firm. 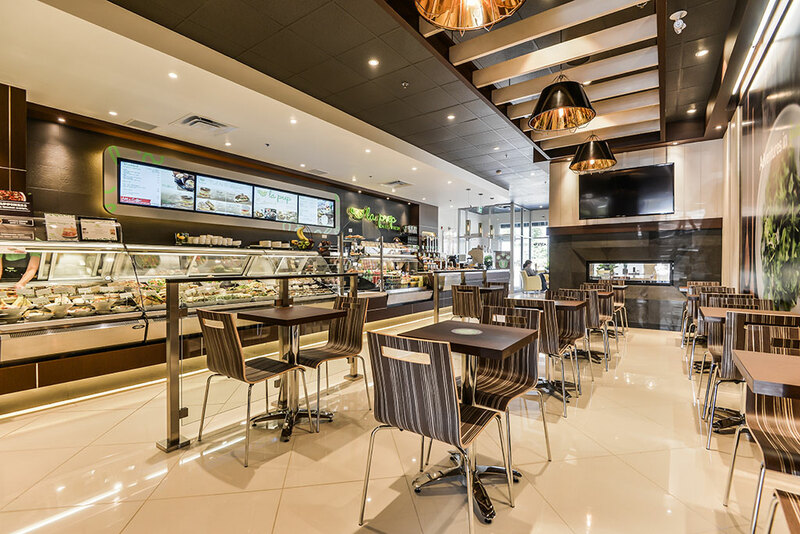 Engage in diverse projects in many of Canada’s growth sectors, including: financial services, healthcare institutions, retail businesses, restaurants and other food service facilities. 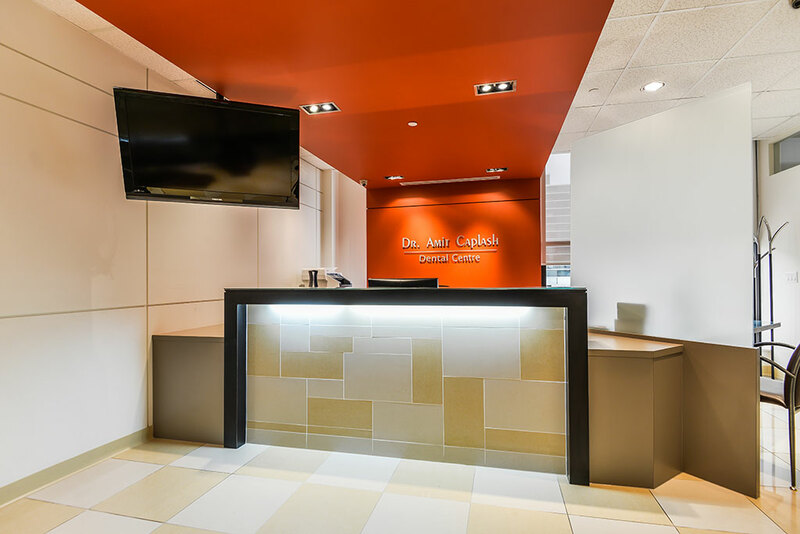 Prioritize and meet the diverse design needs of all clients, from established institutional clients or new brand sole practitioners. 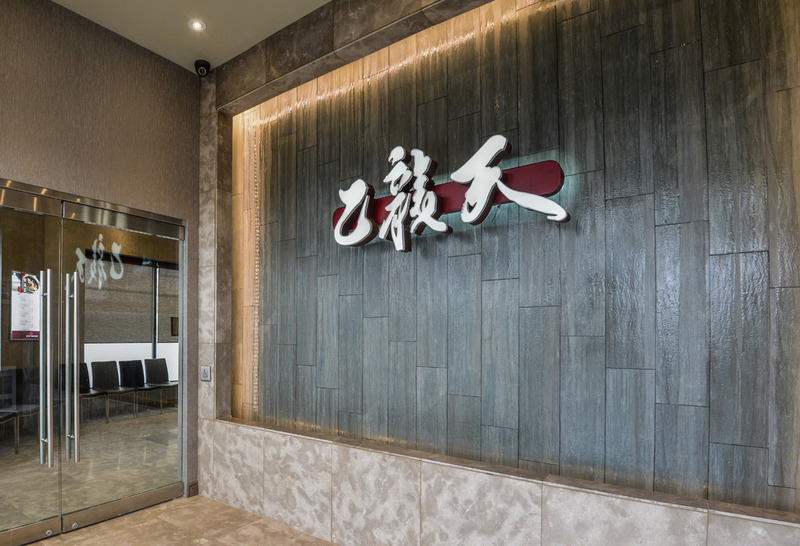 Our founding principal, Albert Hui, has enjoyed a successful career in interior design since 1979. 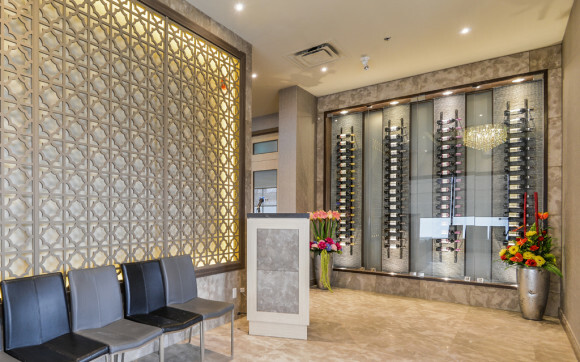 He is a member of the Association of Registered Interior Designers of Ontario (ARIDO), Interior Designers of Canada (IDC), American Society of Interior Designers (ASID), and has a qualified Building Code Identification Number (BCIN) for Complex Building, Large Building, Small Building and Houses. 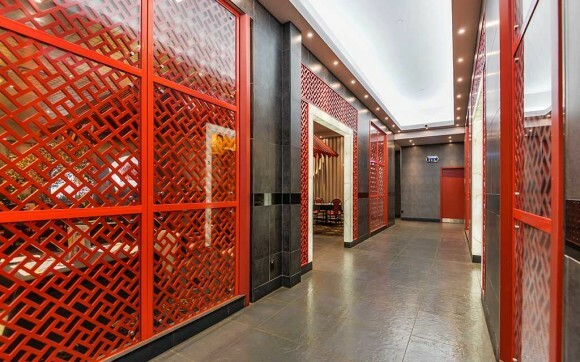 He has also served on various professional committees, and has been a regular exam evaluator for the National Council Interior Designers Qualification (NCIDQ) since 1996. 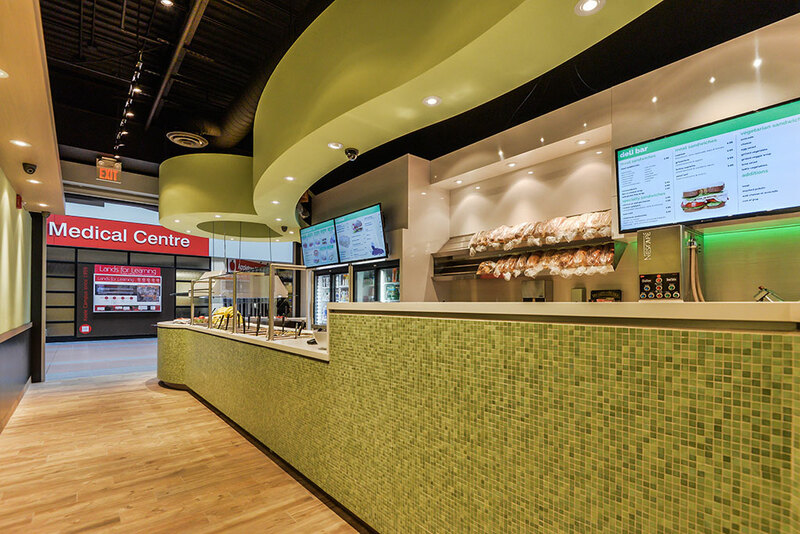 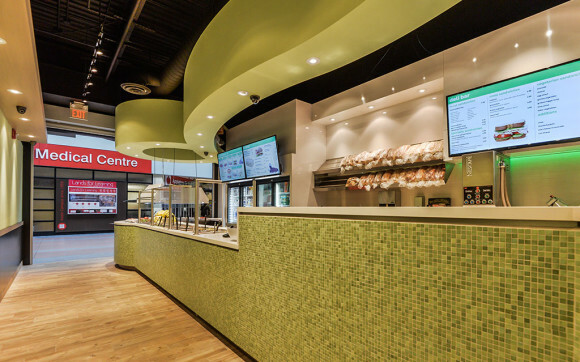 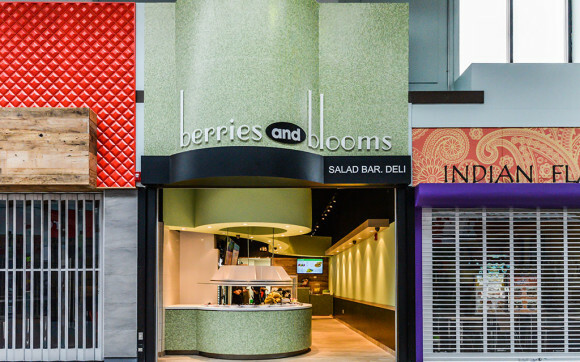 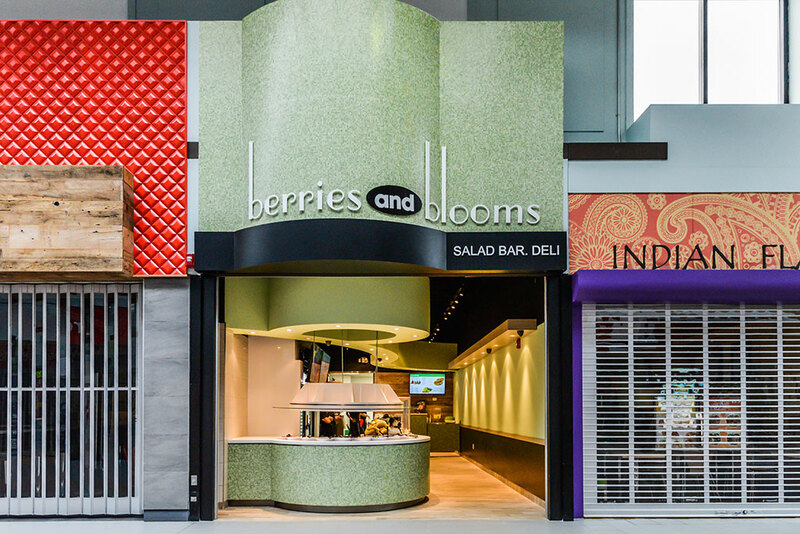 Situated in a University retail arcade, Berries & Blooms offers fresh fruits, vegetables, salads and deli sandwiches. 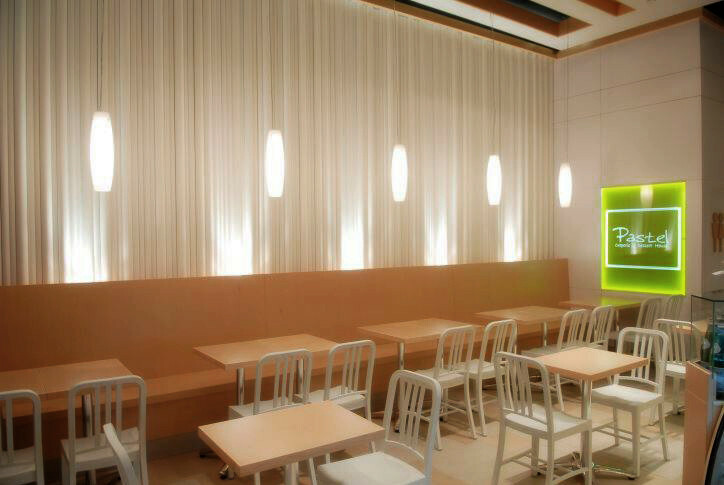 The freshness of the menu is translated through the simple color palette and clean, direct materials. 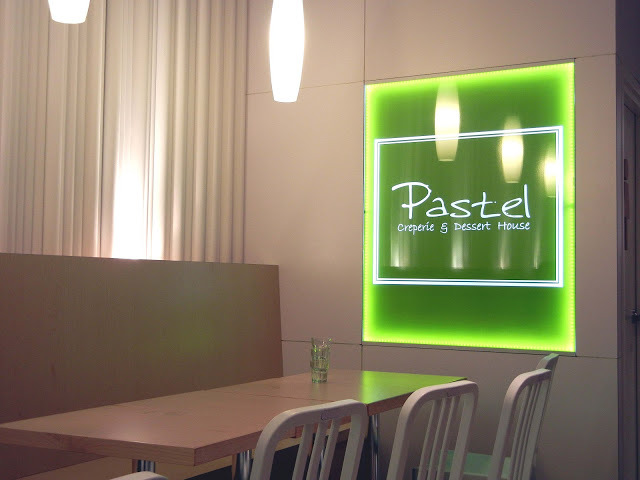 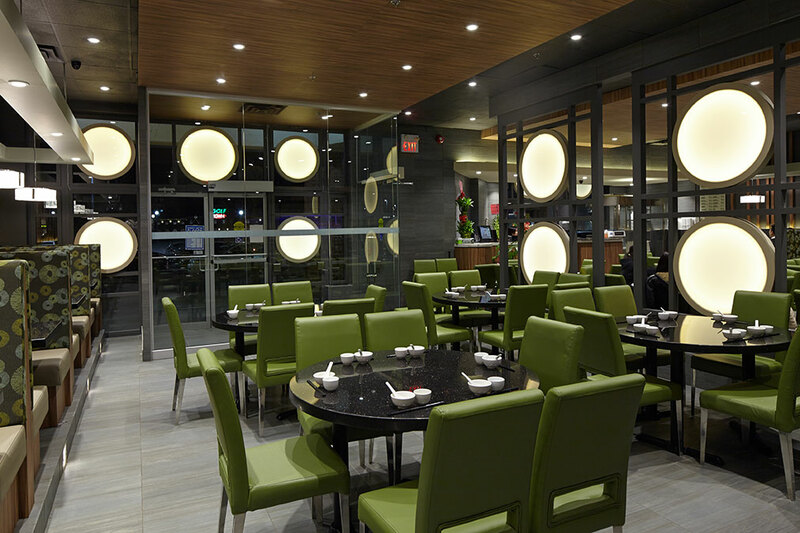 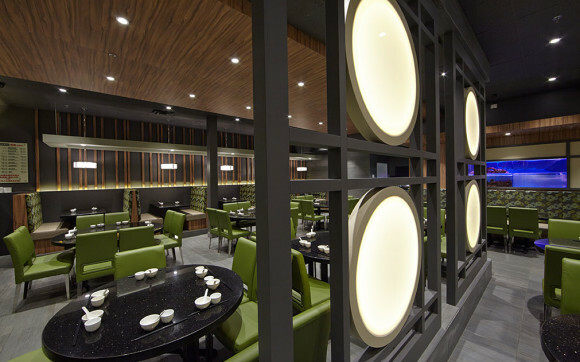 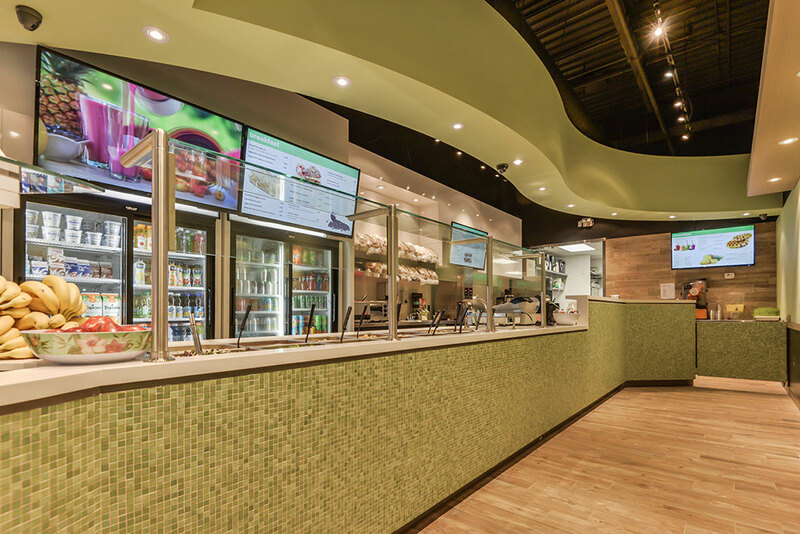 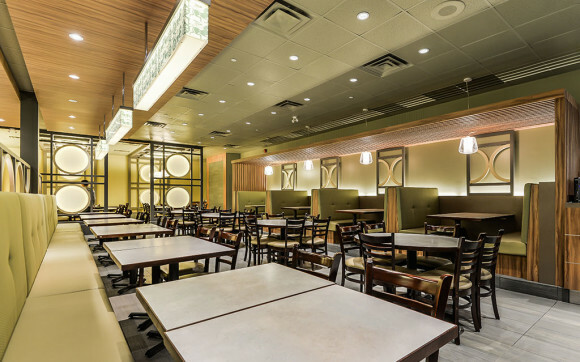 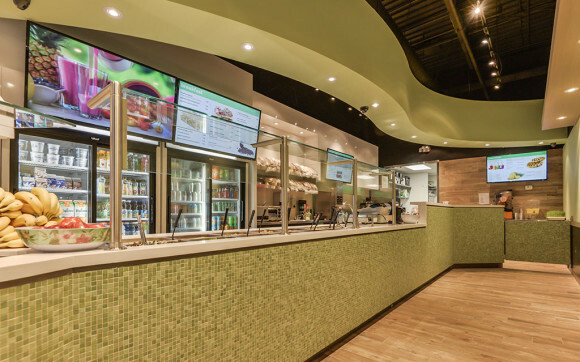 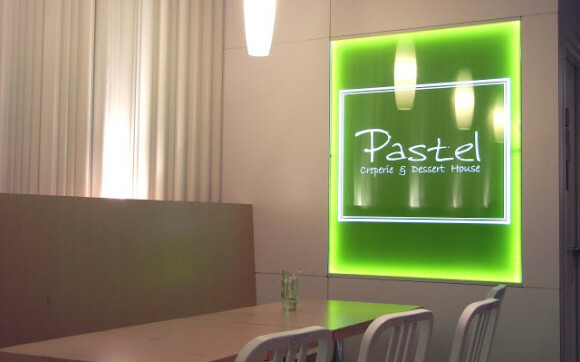 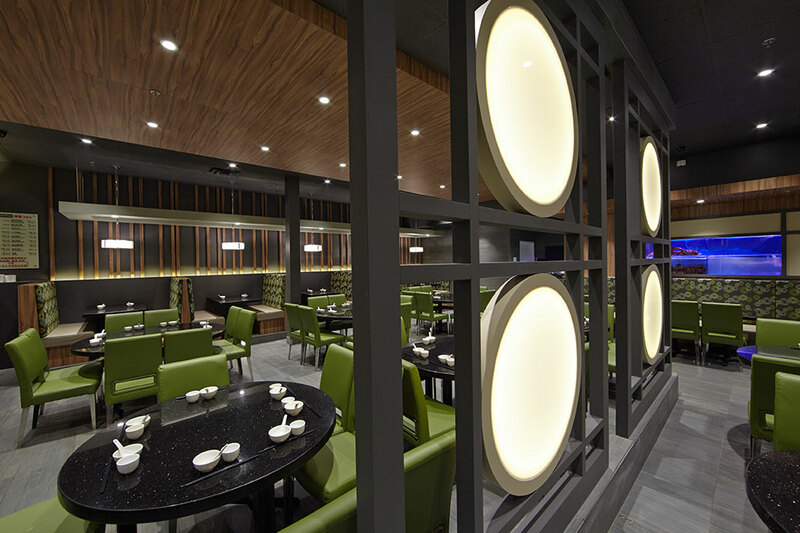 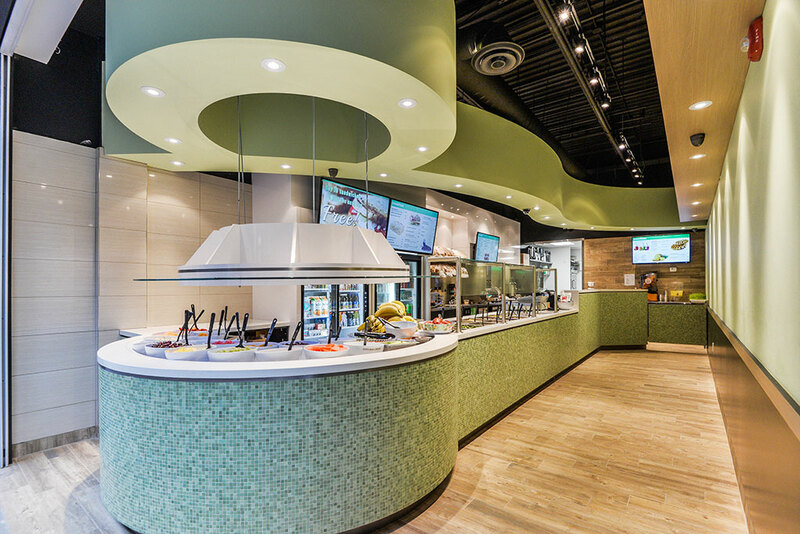 Emphasis on green also reinforces the fresh image of the restaurant. 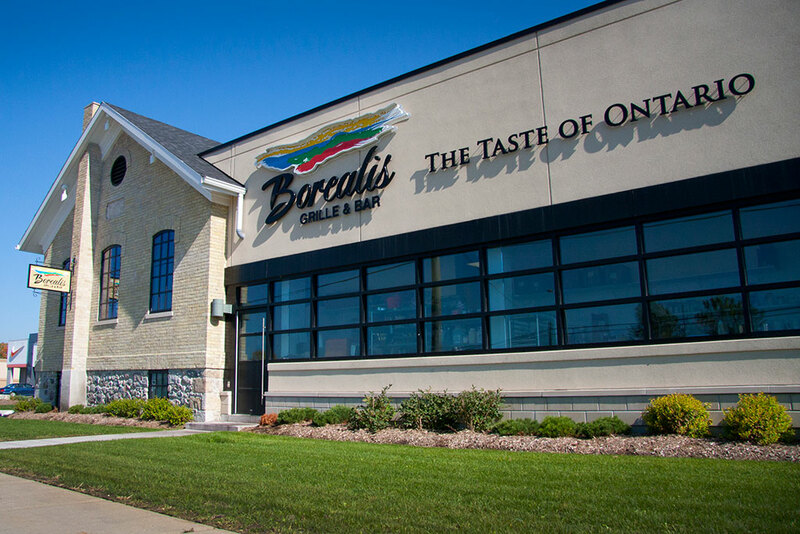 Known to promote and serve "The Taste of Ontario". 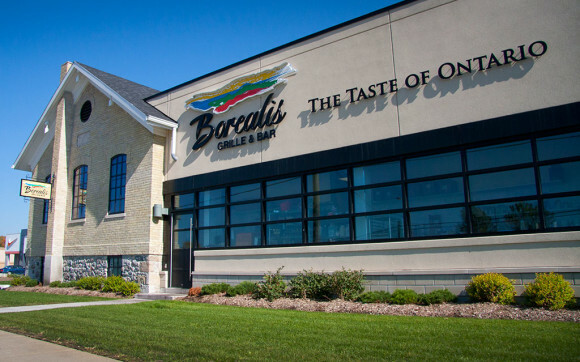 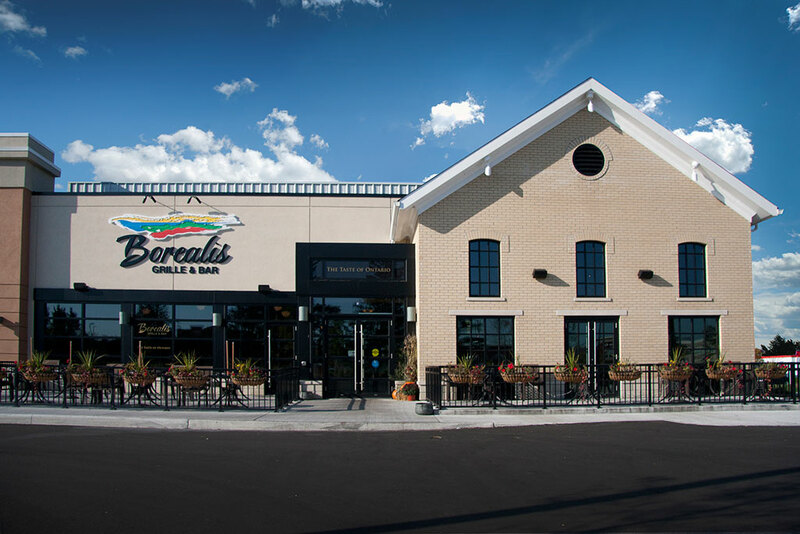 One of Borealis Grillhouse & Pub's core value is to respect local heritage and is evident in the decor of the restaurant. 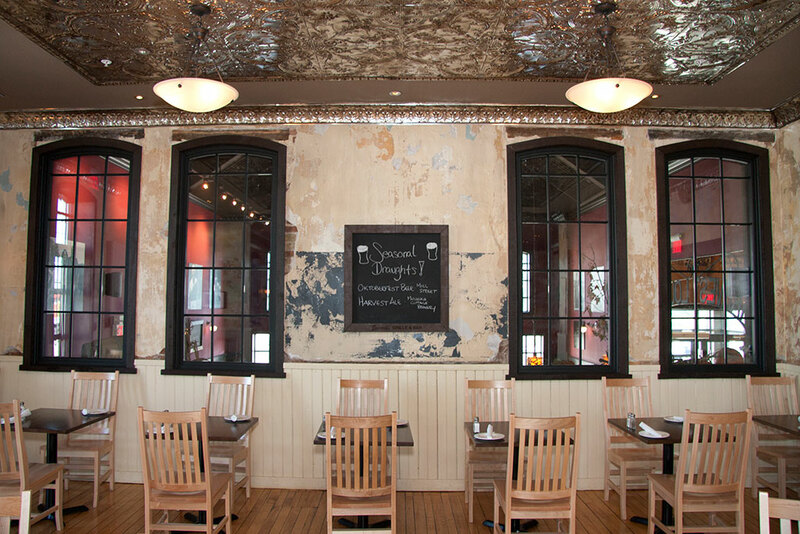 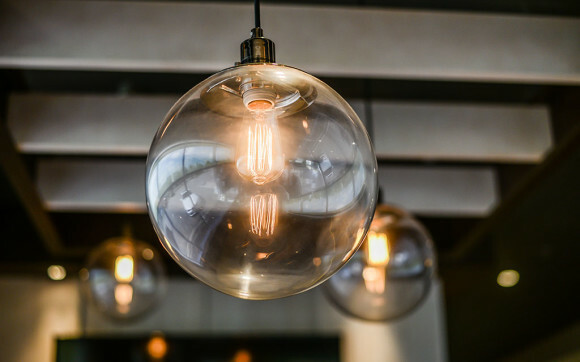 To respect and enhance the once schoolhouse building, original hardwood floors were refinished with the addition of tin ceilings and custom metal work completed by local artisans. 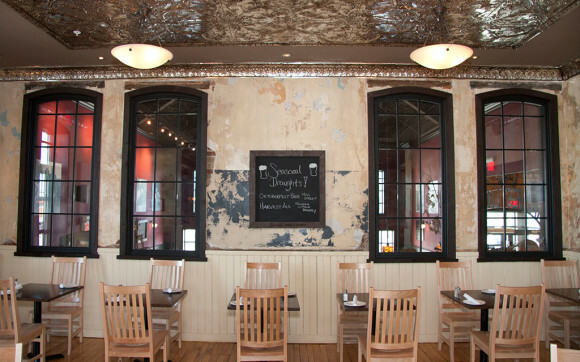 Much of the interior design has been kept and restored to emphasize the history of the building. 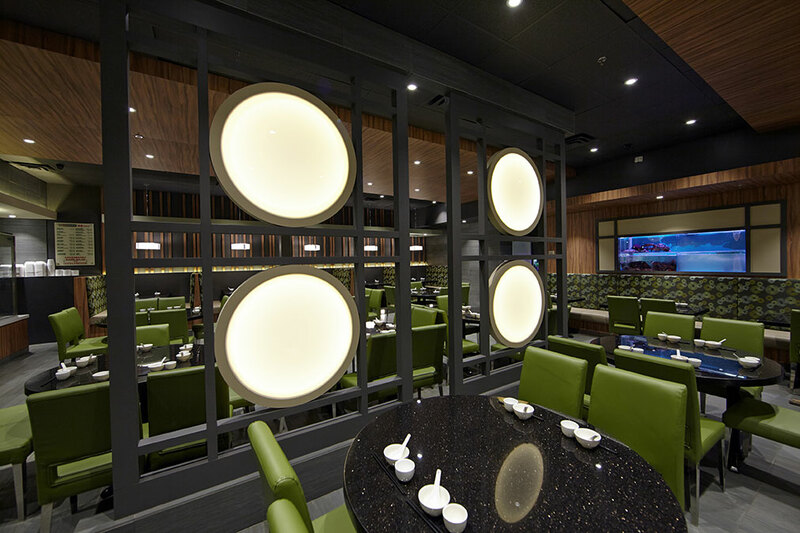 A fresh take on an established restaurant. 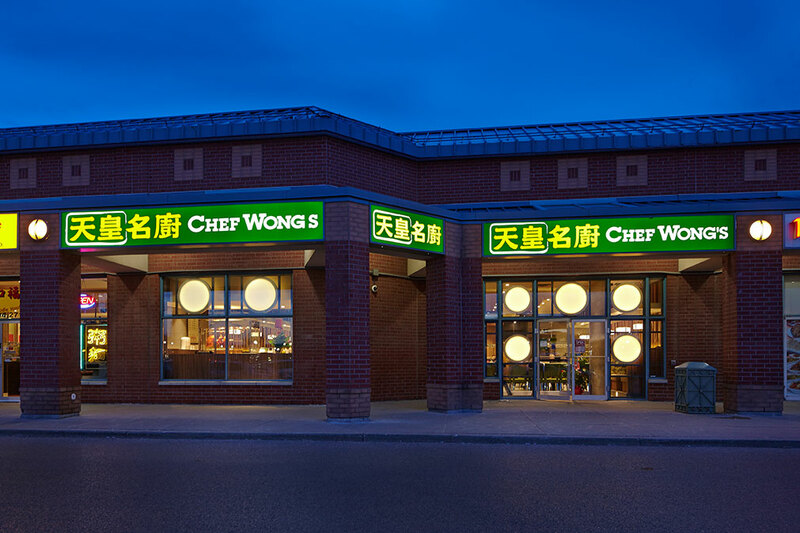 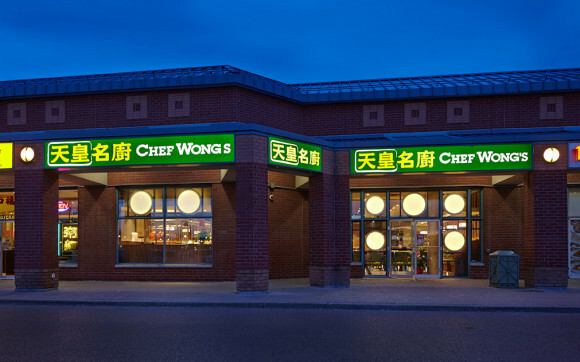 Chef Wong (formerly known as Congee Wong) has been a local's favourite for their Chinese style comfort food. 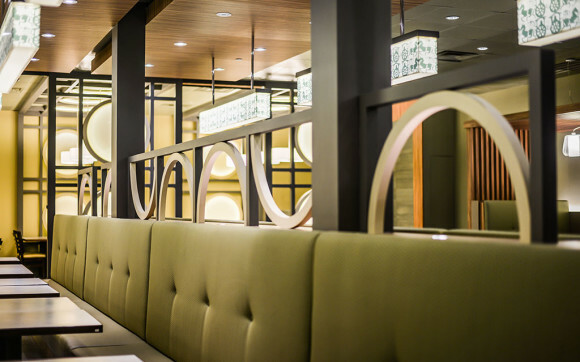 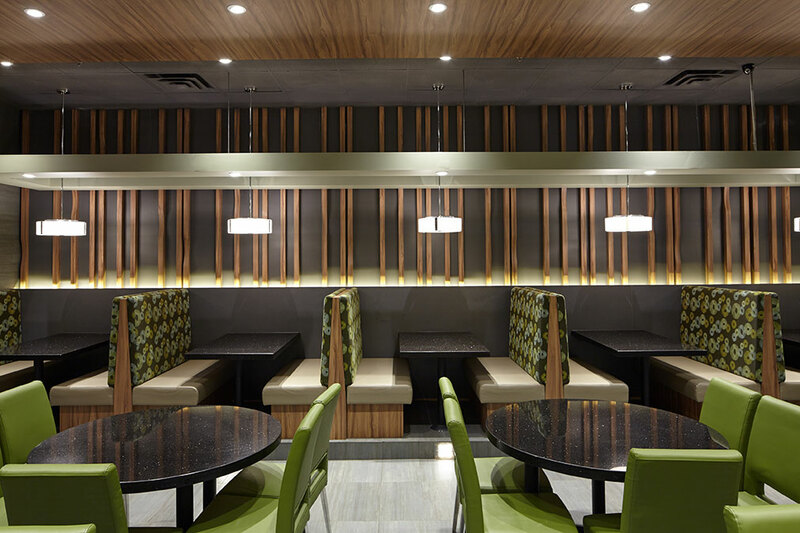 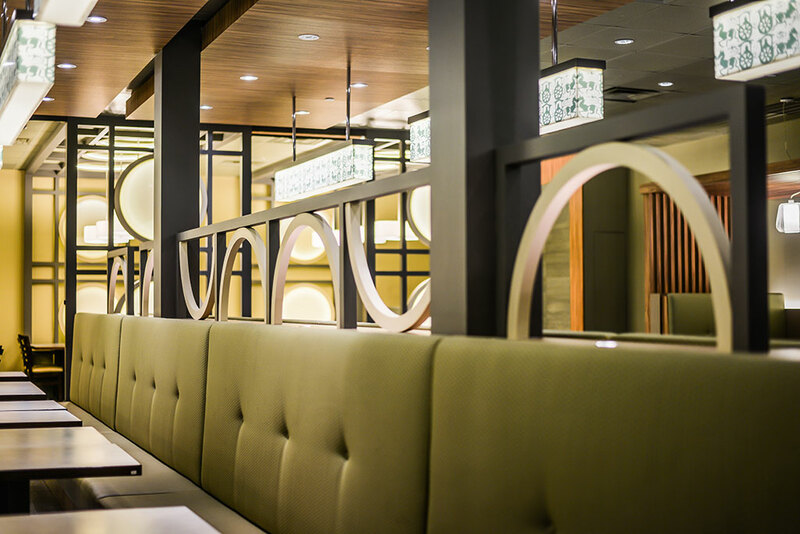 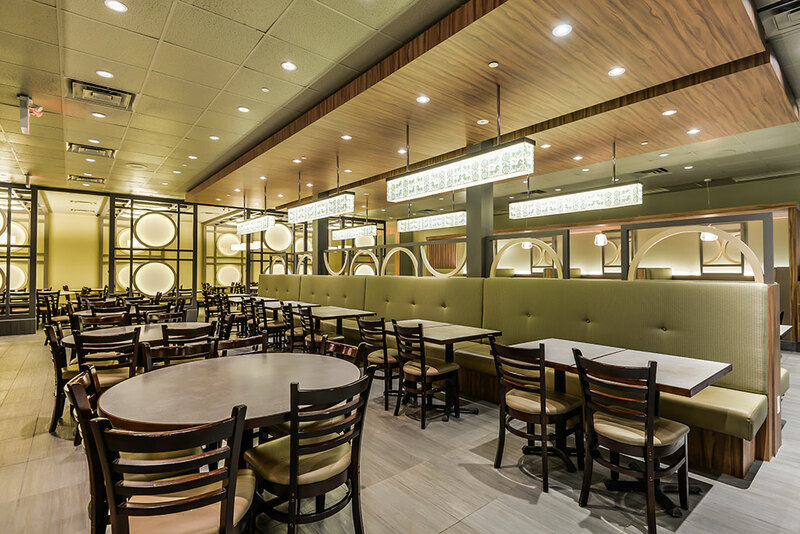 The design intent was to preserve the lively atmosphere of the existing restaurant while creating an intimate and inviting space through the use of wood materials and custom designed decorative screens to subdivide the space. 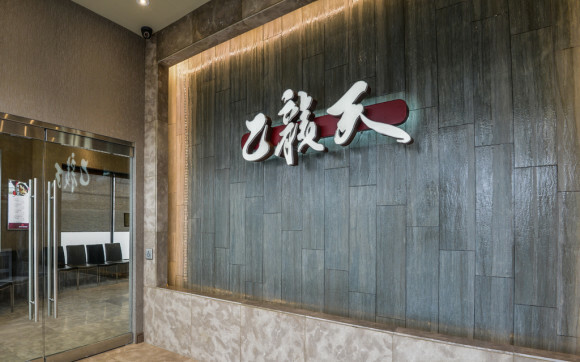 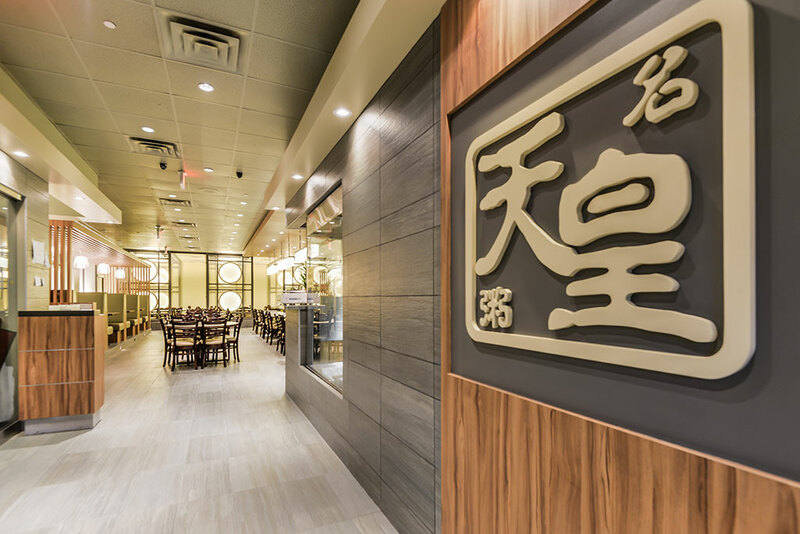 Building upon the well established chain's colors and graphics, the restaurant takes essence from the existing chain that is known within the community and adds a contemporary twist. 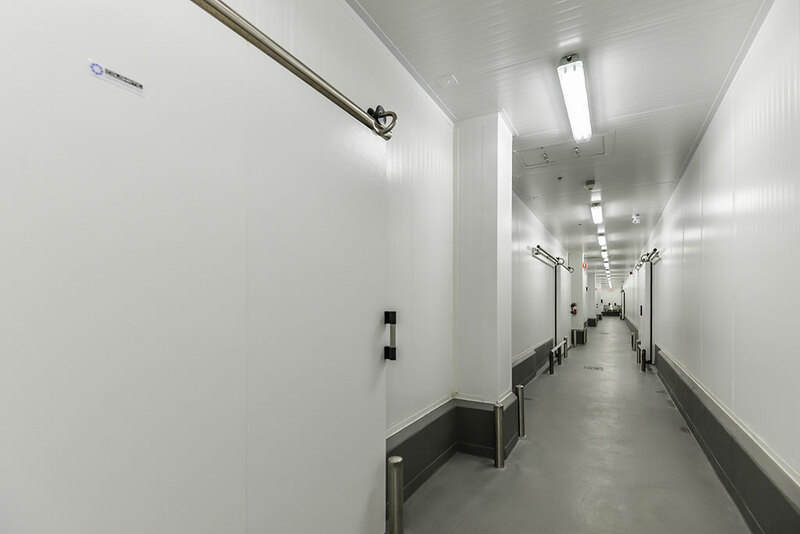 State of the art production and distribution facility. 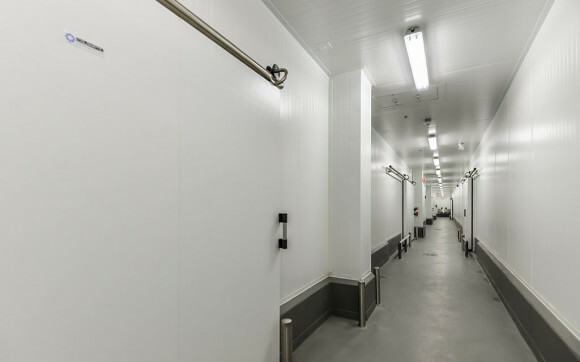 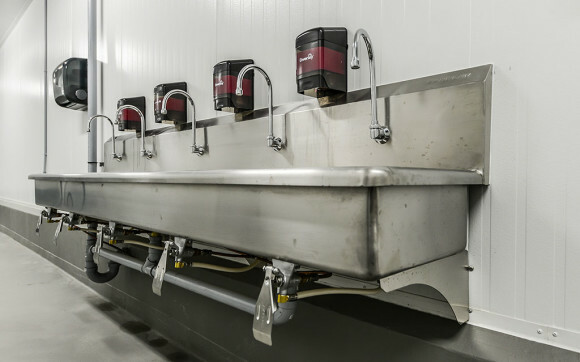 Diana Distribution Center offers food processing and temperature controlled warehouses that caters to food services across Ontario. 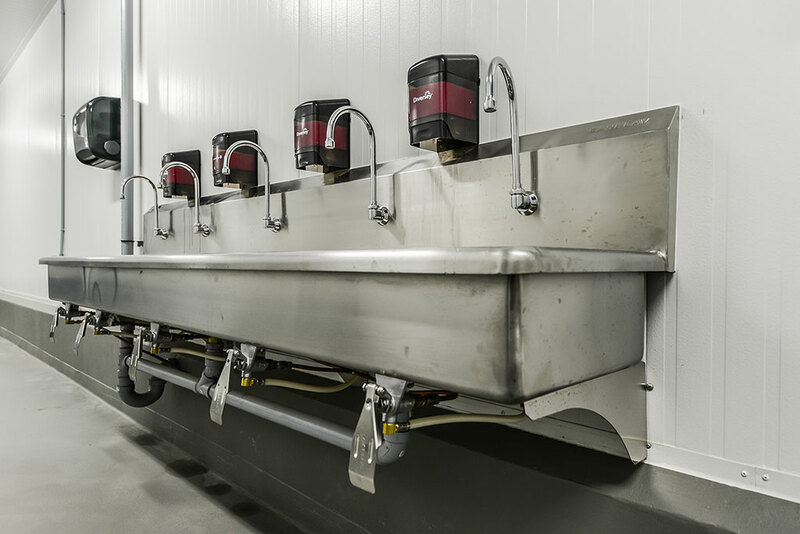 The processing plant meets and exceeds OMAFRA(Ontario Ministry of Agriculture, Food and Rural Affairs) standards. 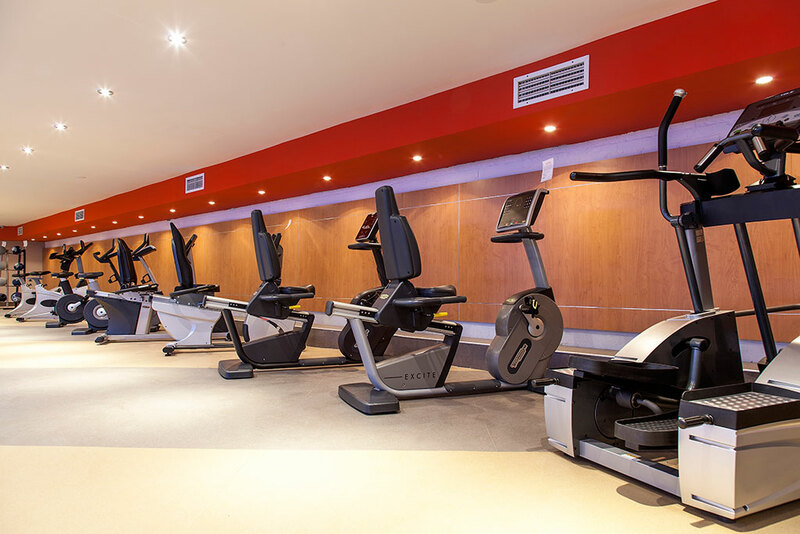 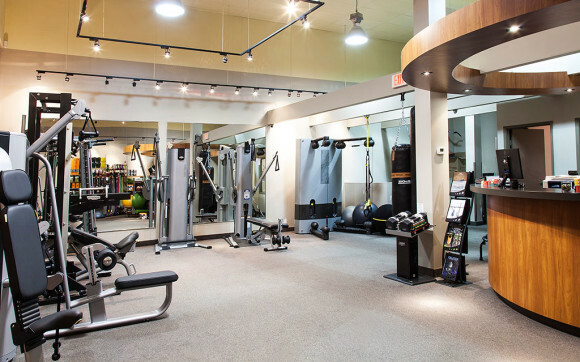 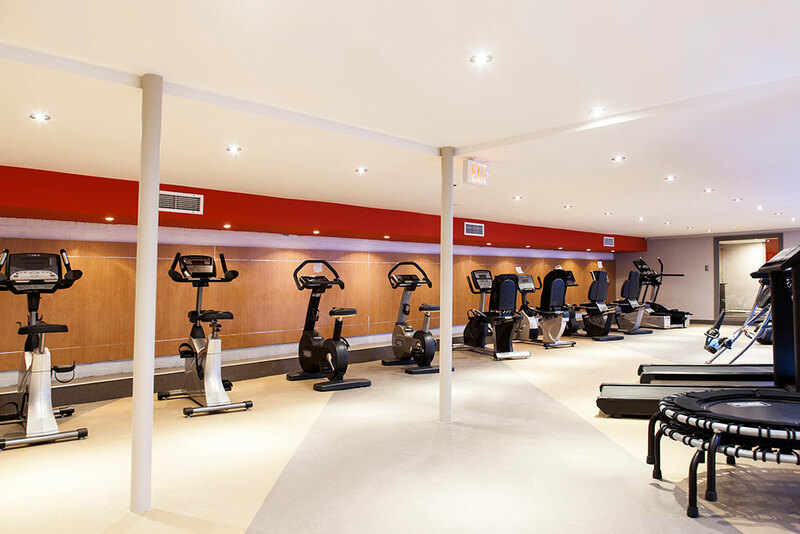 Located in one of Toronto's prestigious neighbourhoods, Foremost Fitness provides top-of-the-line fitness equipment to both residential and commercial clients. 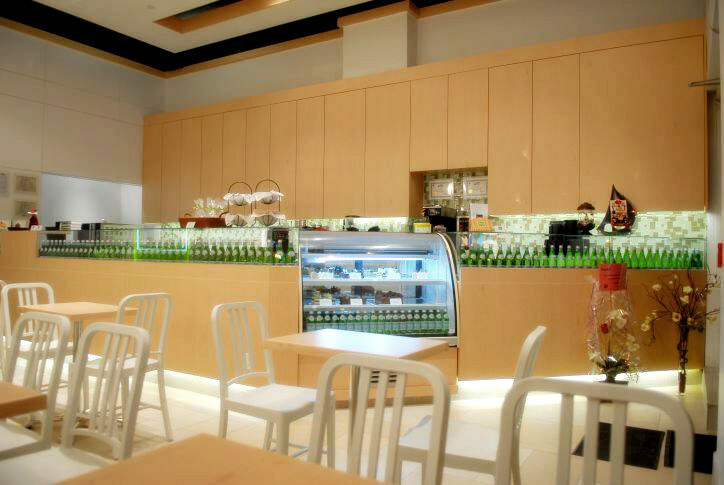 The showroom provides a setting for customers to maximize their experiences with the equipments and products. 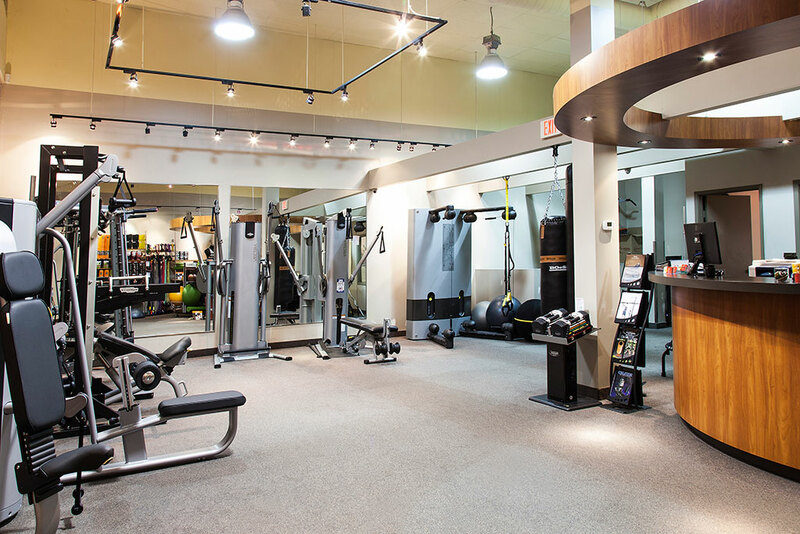 Utilizing gym-grade rubber floor further enhances the retail experience. 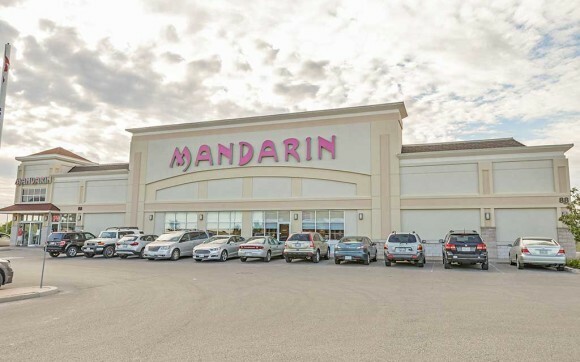 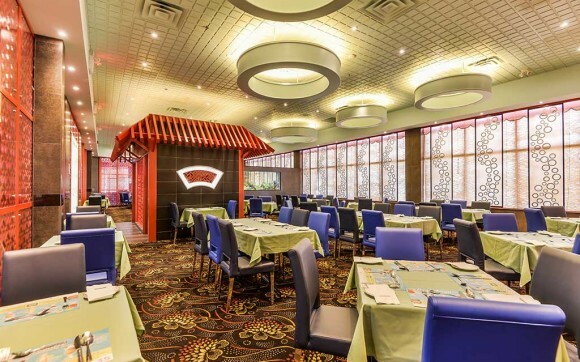 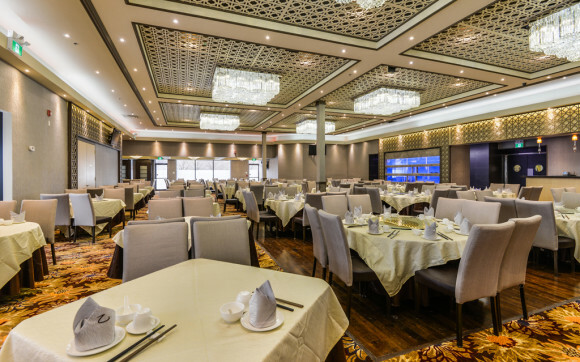 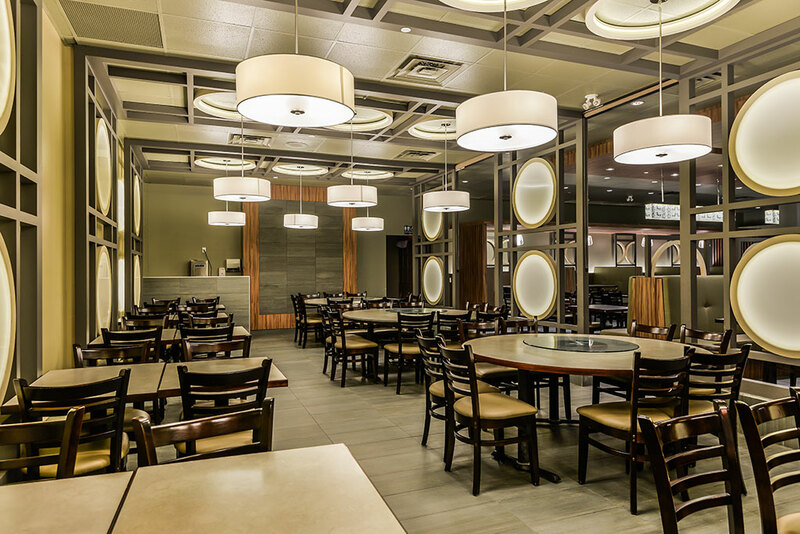 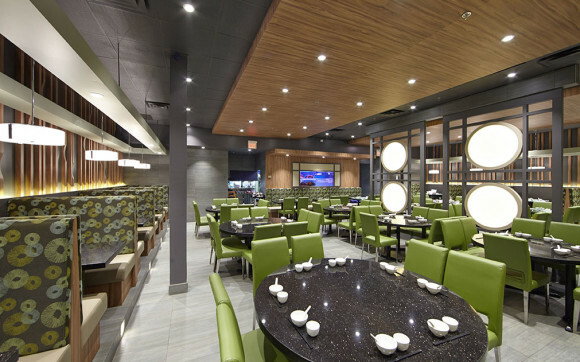 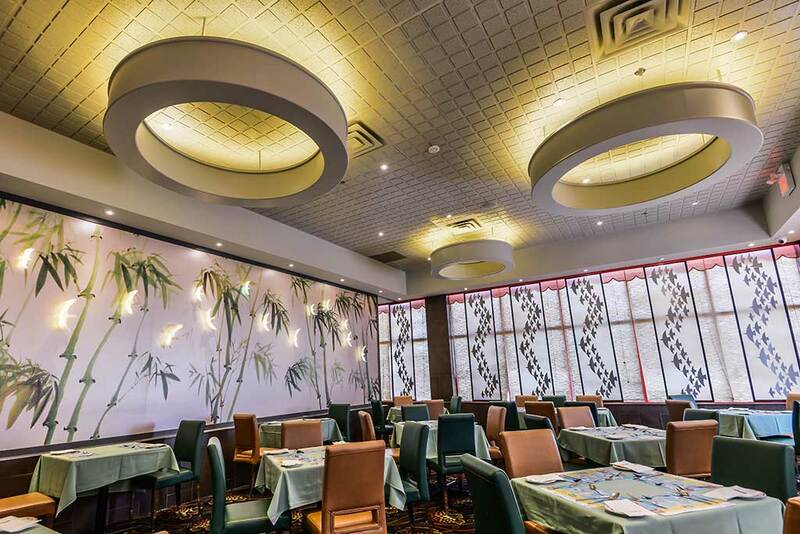 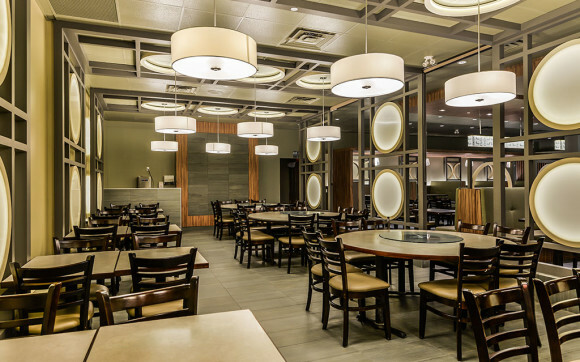 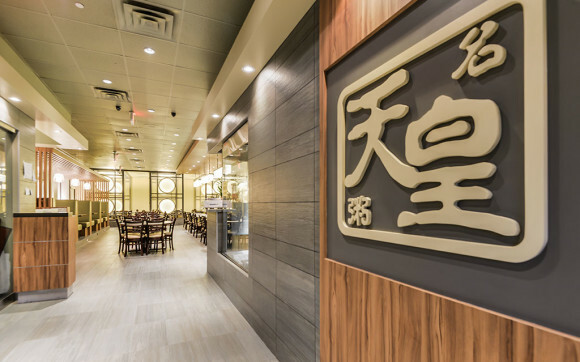 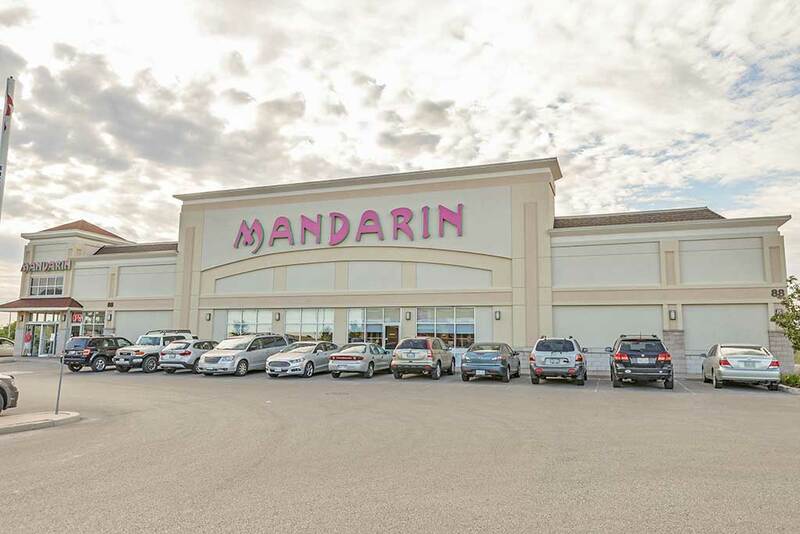 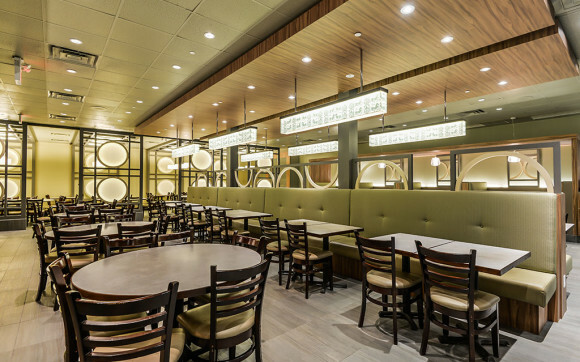 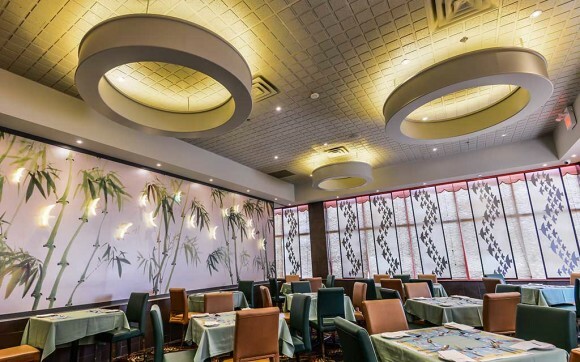 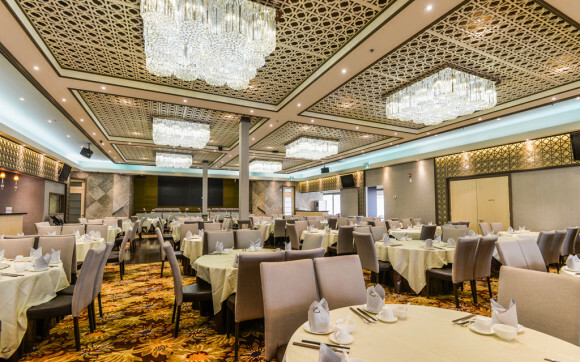 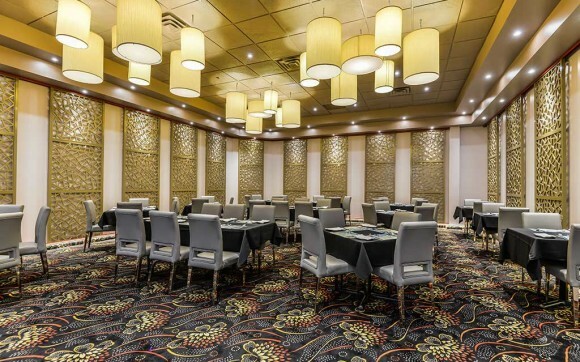 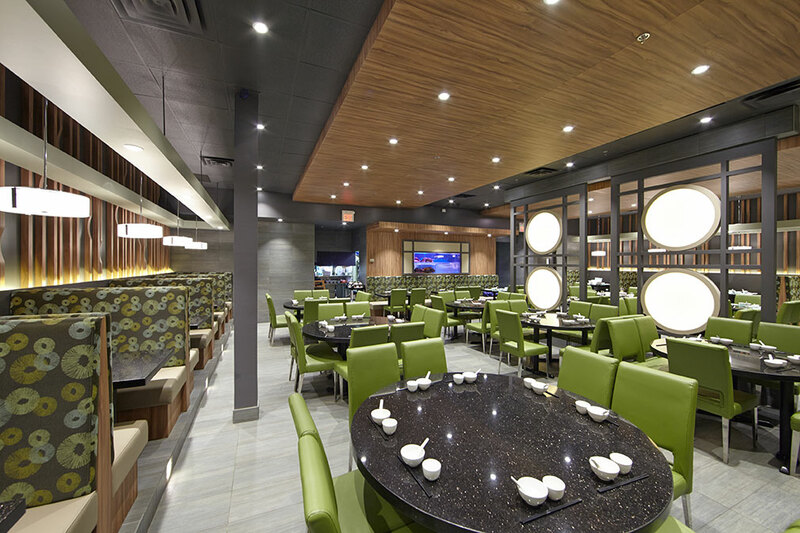 With over 20 locations across South-Western Ontario, Mandarin is an award winning Chinese-Canadian buffet restaurant chain. 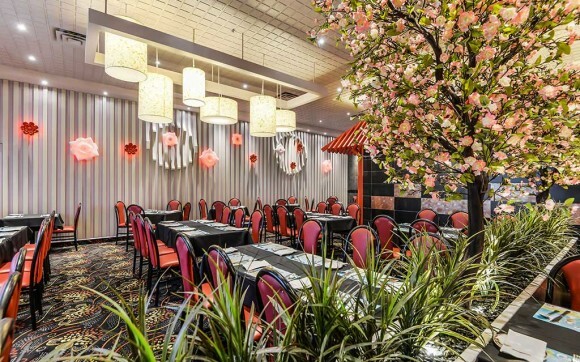 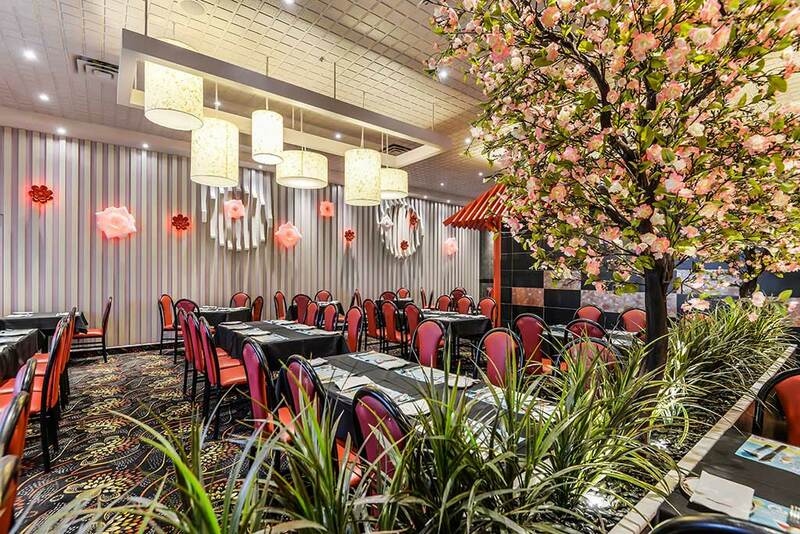 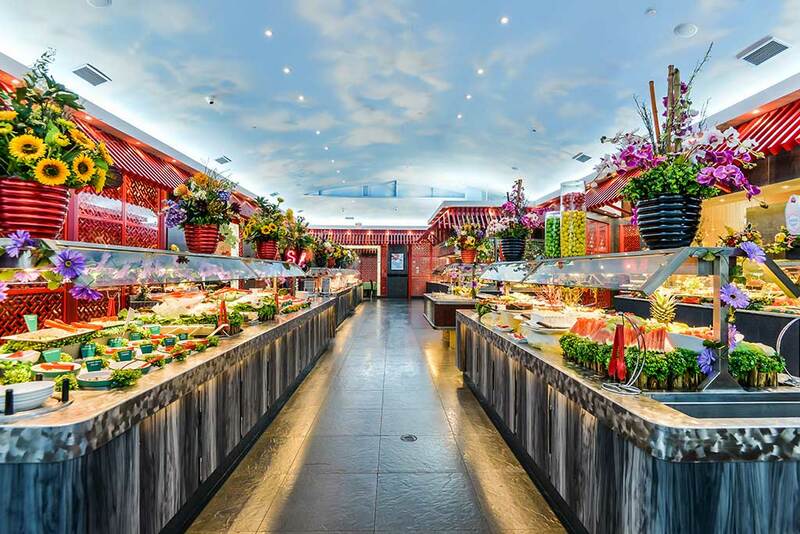 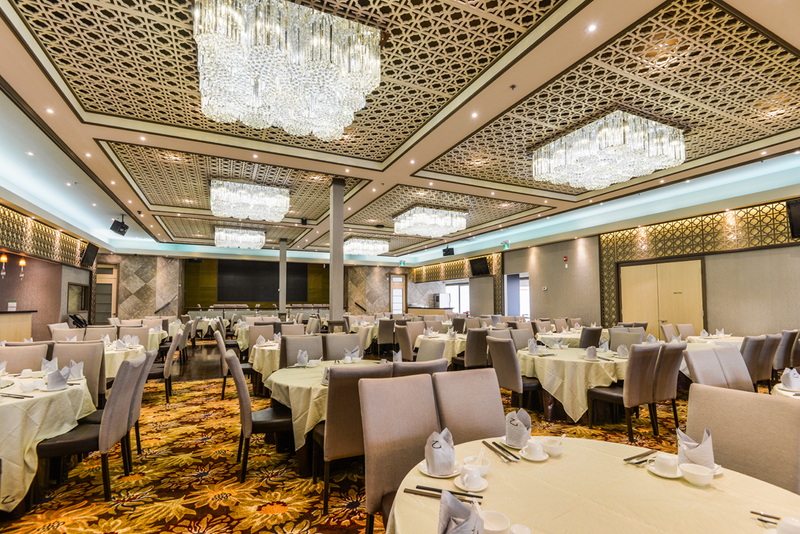 The restaurants are divided into three dining halls with unique themes and are brought together in the central buffet area that mimics Chinese streetscapes. 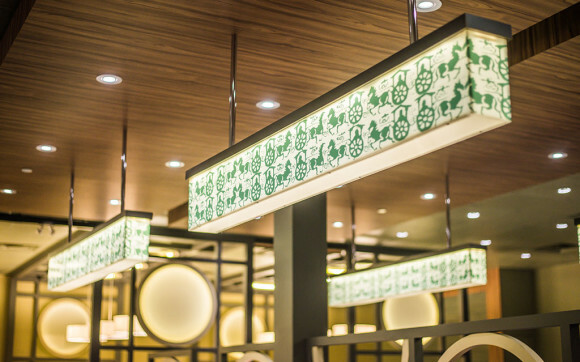 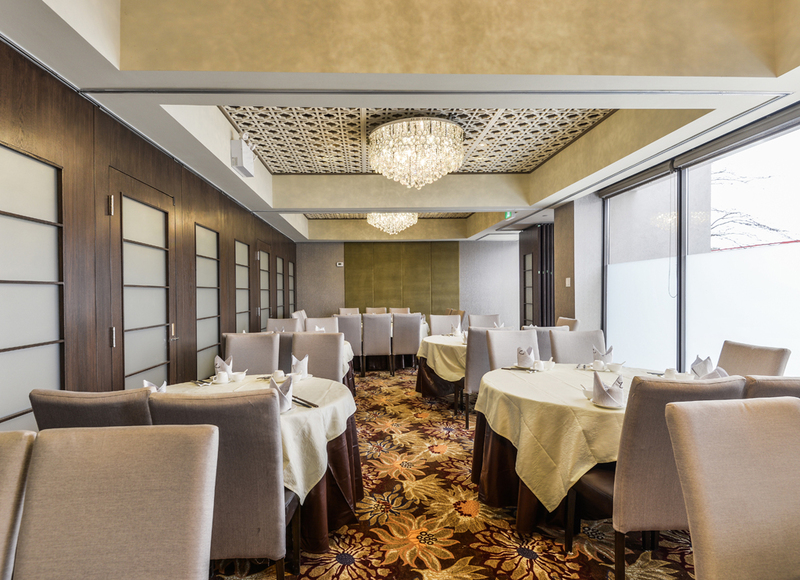 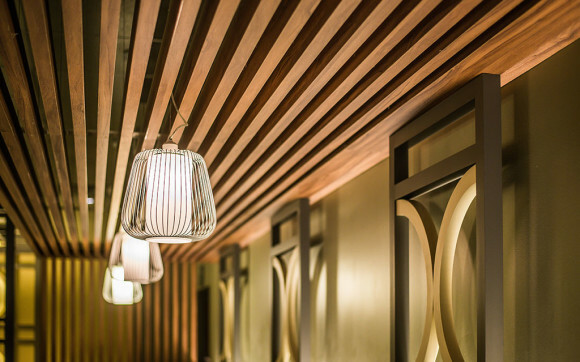 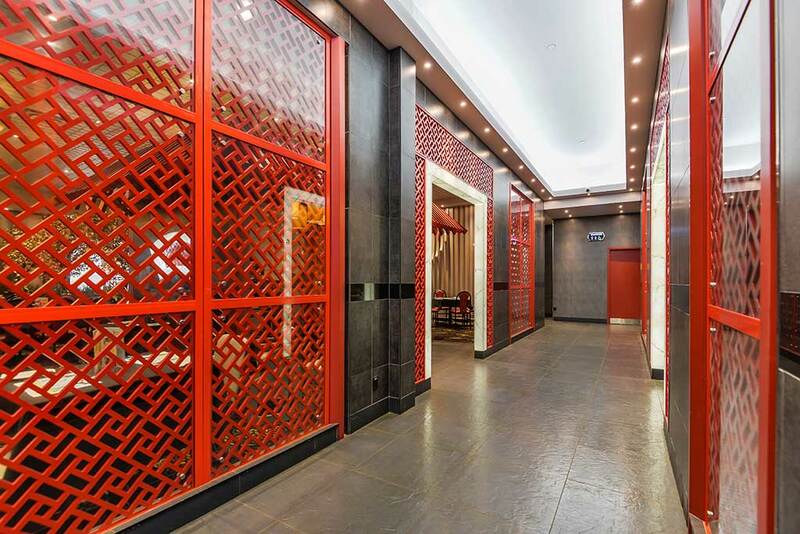 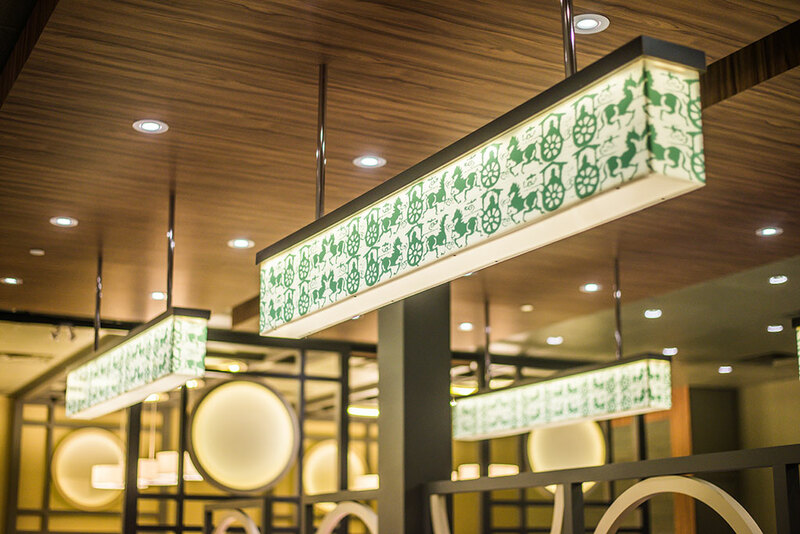 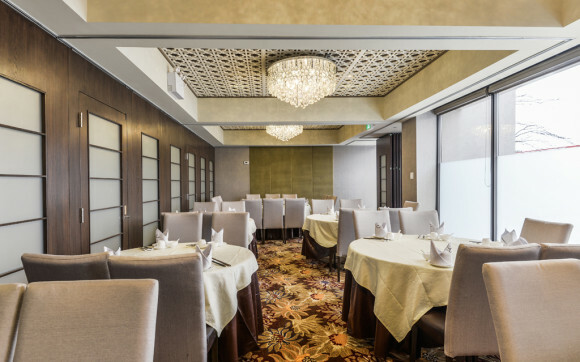 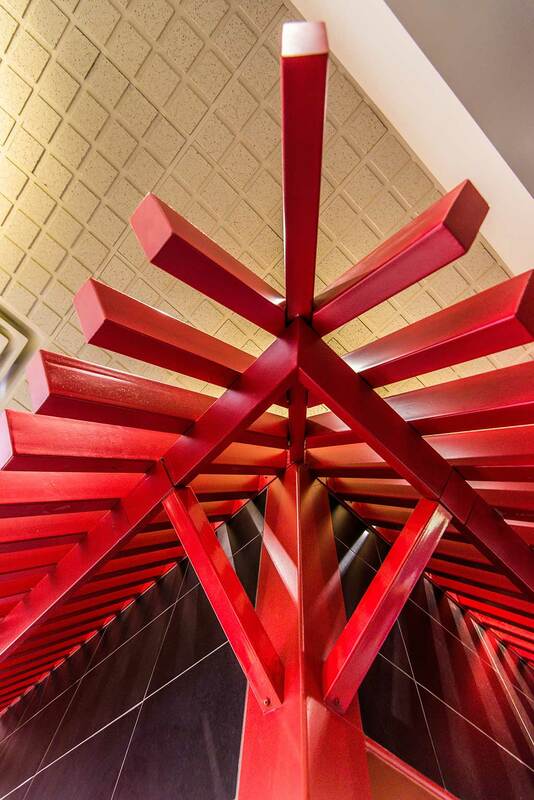 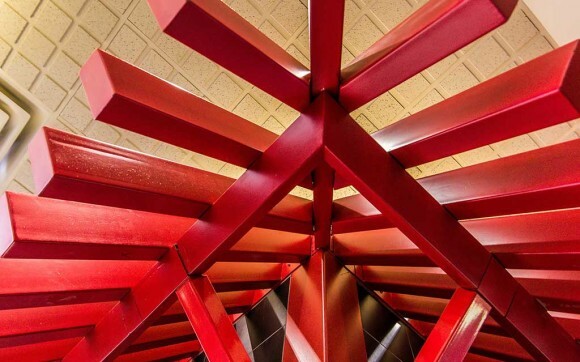 Materials are meticulously selected to enhance the oriental theme throughout the restaurant. 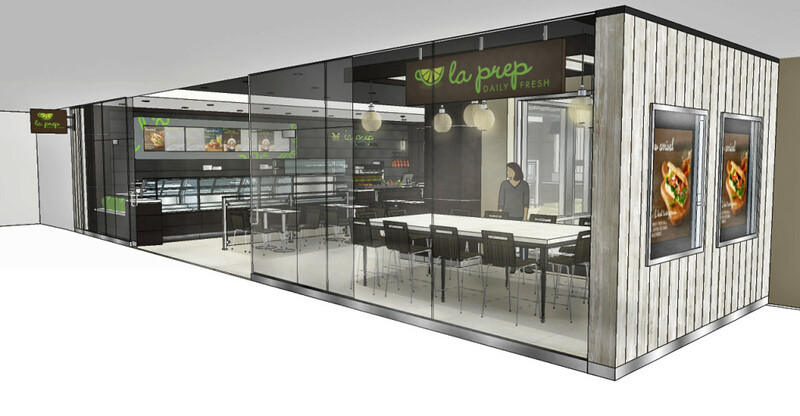 La Prep is a progressive and innovative concept, bringing healthy restaurant food to an everyday, fast-casual environment. 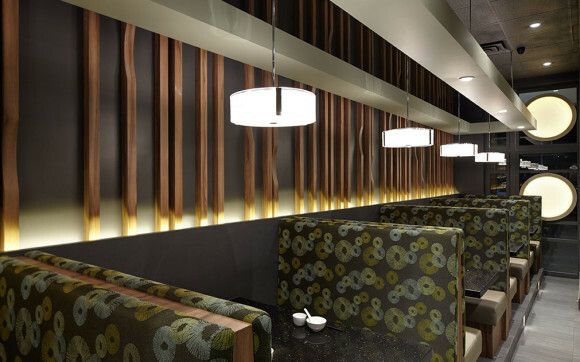 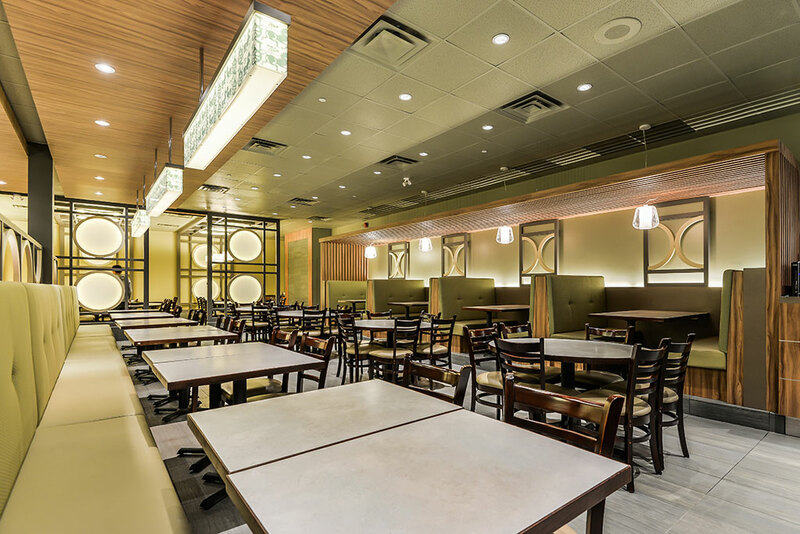 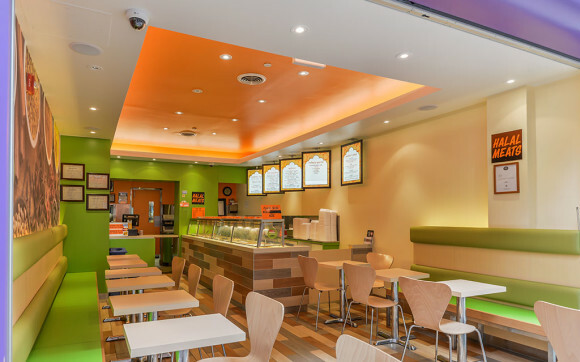 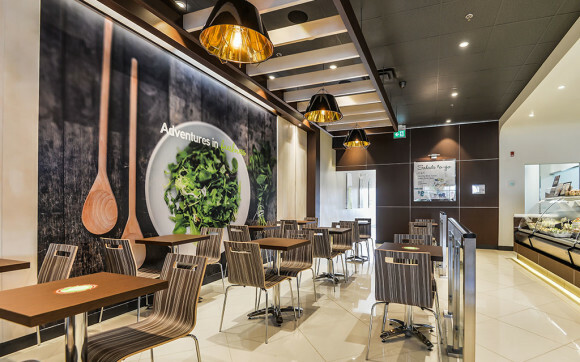 The restaurant environment brings emphasis on sights and smell of freshly prepared foods and beverages through the use of neutral colors and organic materials. 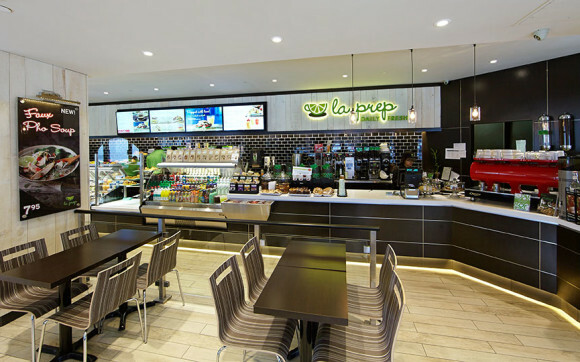 La Prep's Eastern Canada corporate store. 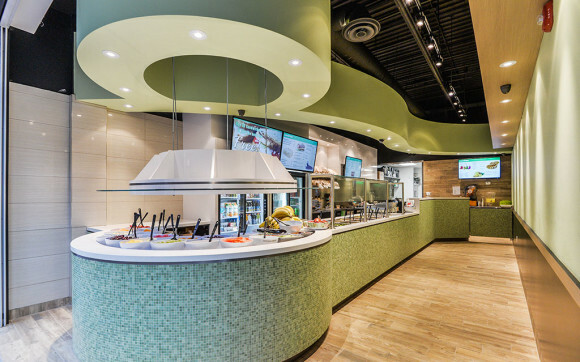 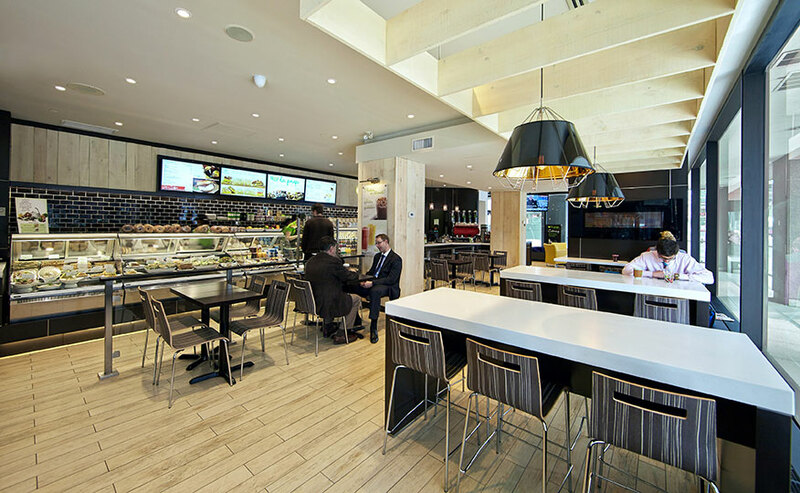 The restaurant showcases materials and design elements that best represents the brand's emphasis on "Daily Fresh". 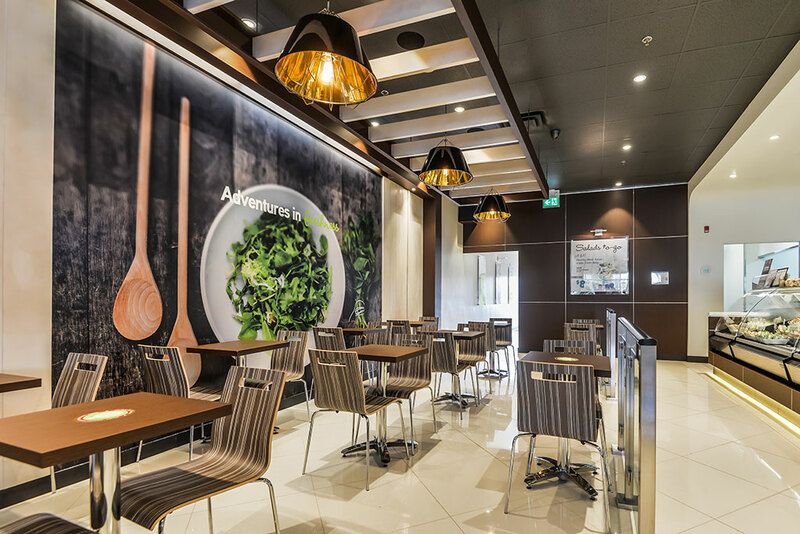 Dark grey slate contrasts with maple wall planks are complimented with polished tiled floor to create a sophisticated yet casual food experience. 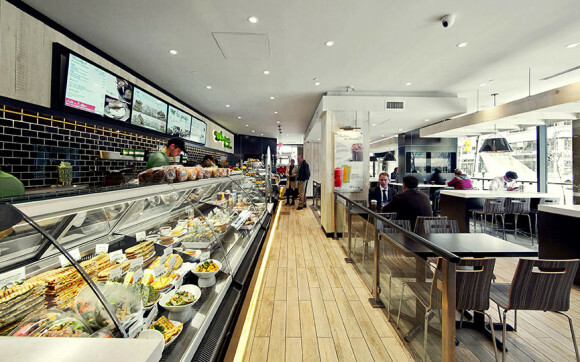 A modern Creperie serving both savoury and sweet crepes, dessert waffles and unique ice creams. 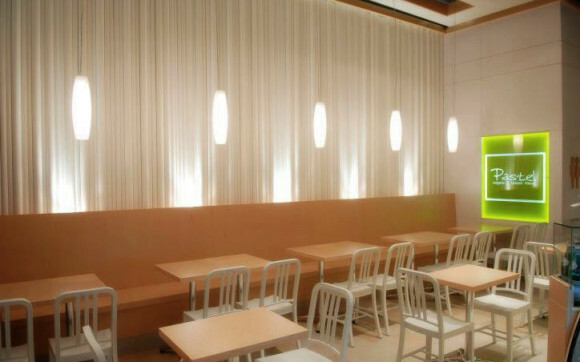 The design is based on simple and minimal elements that gives purity to the space. 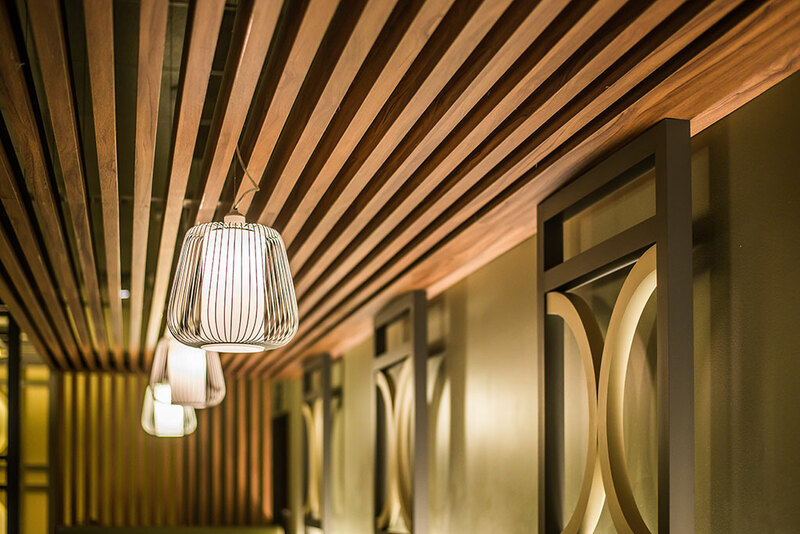 Linear geometry in the space creates a sense of smooth fluid motion often associated with the delicate desserts. 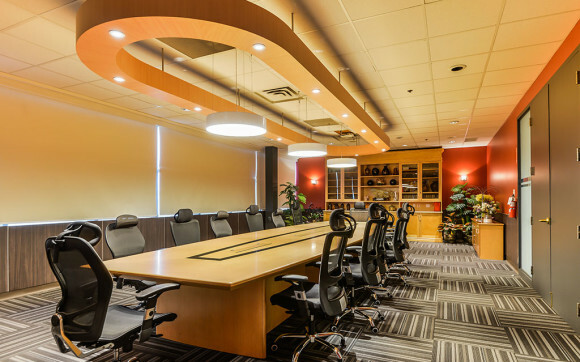 The office space is divided into two areas, defining the financial department and a large flexible seminar room. 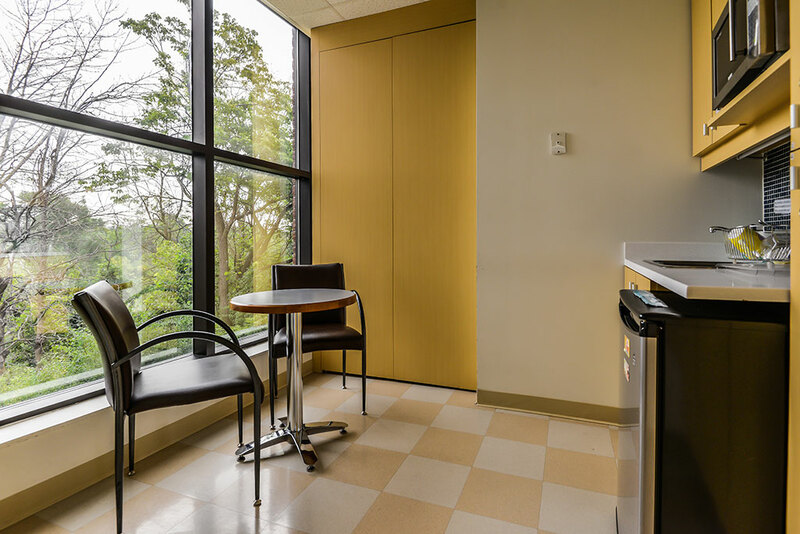 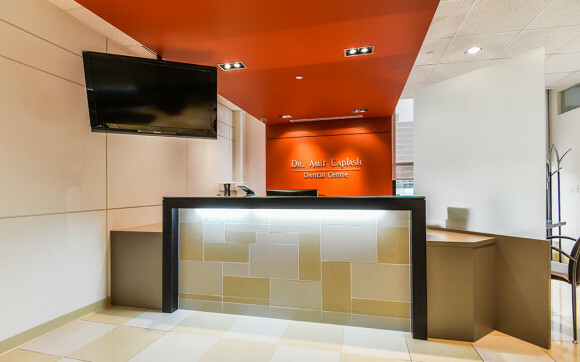 This is created by having the reception area serving as a central space that connects the two distinct area while still maintaining continuality using consistent materials and colors. 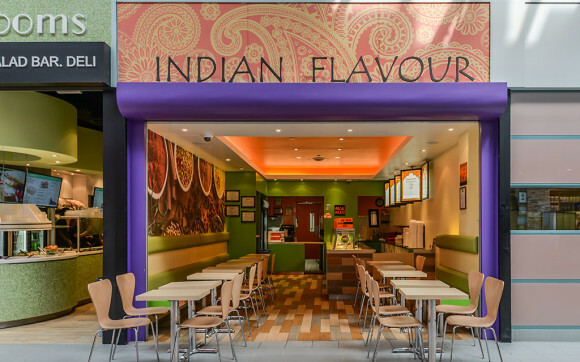 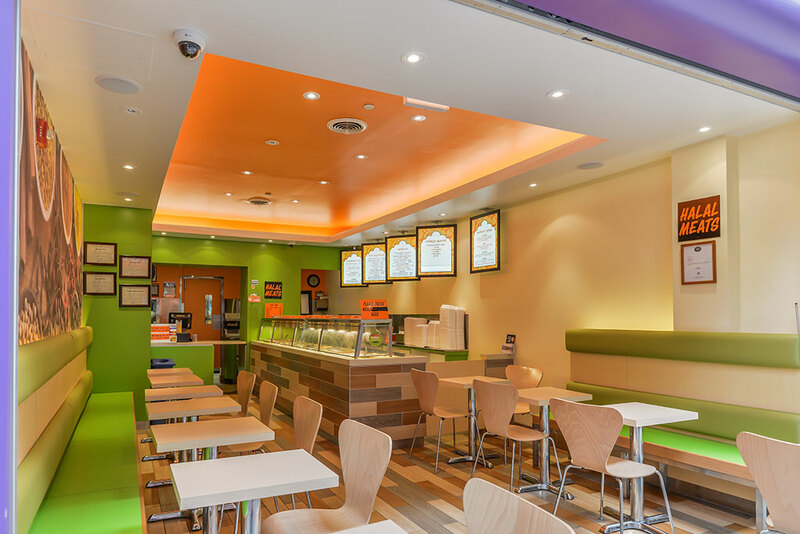 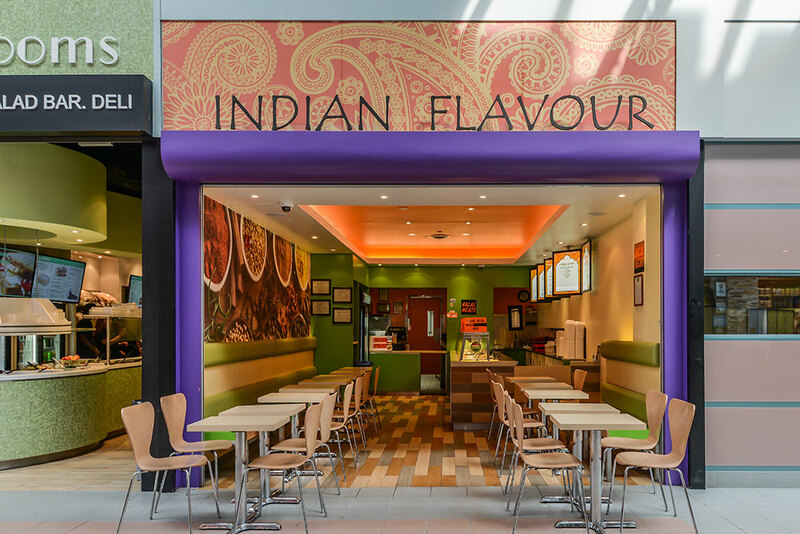 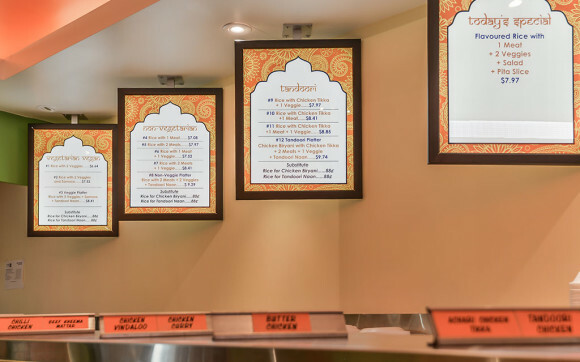 Indian Flavour provides authentic Indian cuisine in a University setting. 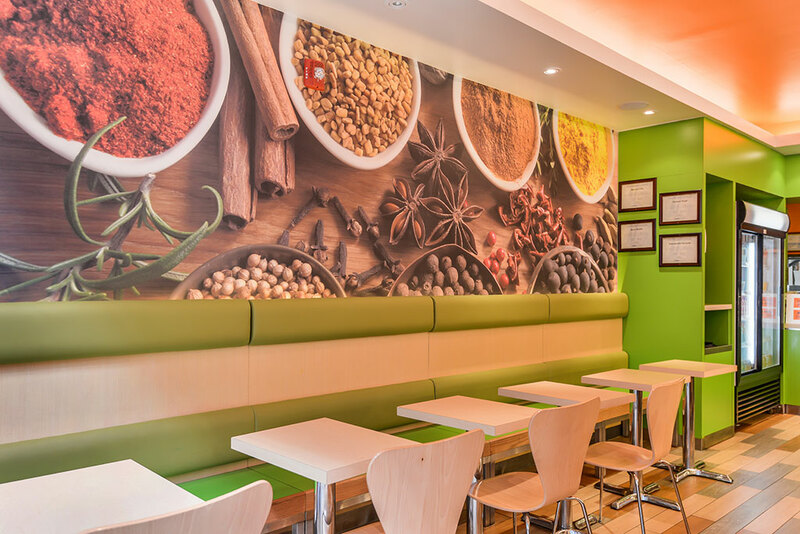 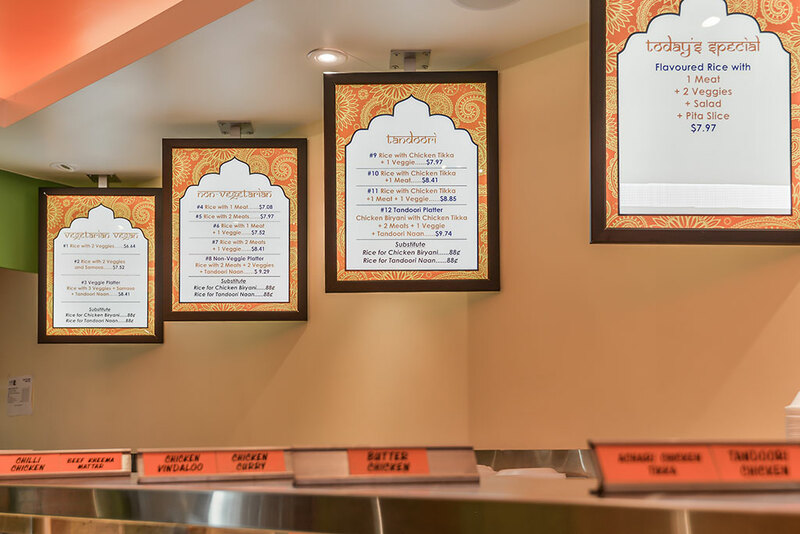 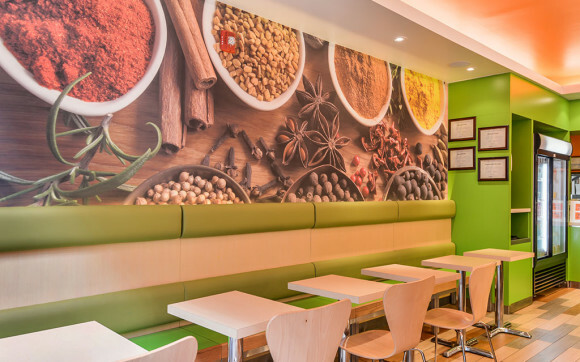 The distinct spices mural are the focal element of the restaurant and is complimented with a splash of flavourful colors that are often associated with India. 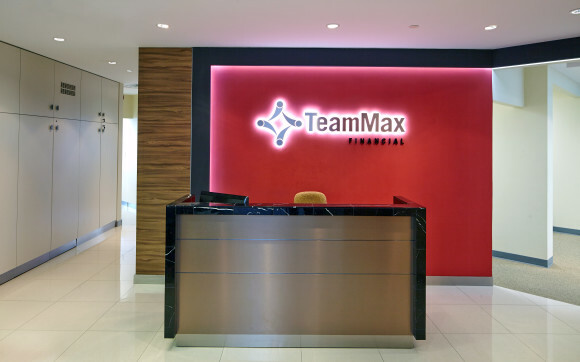 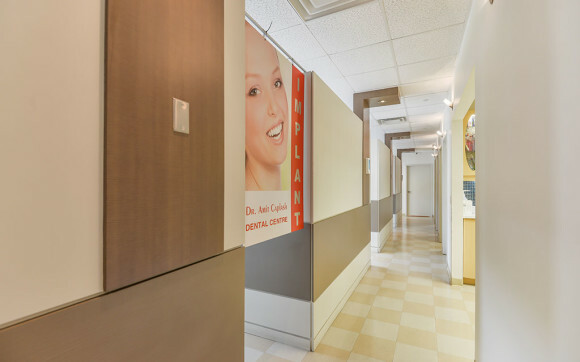 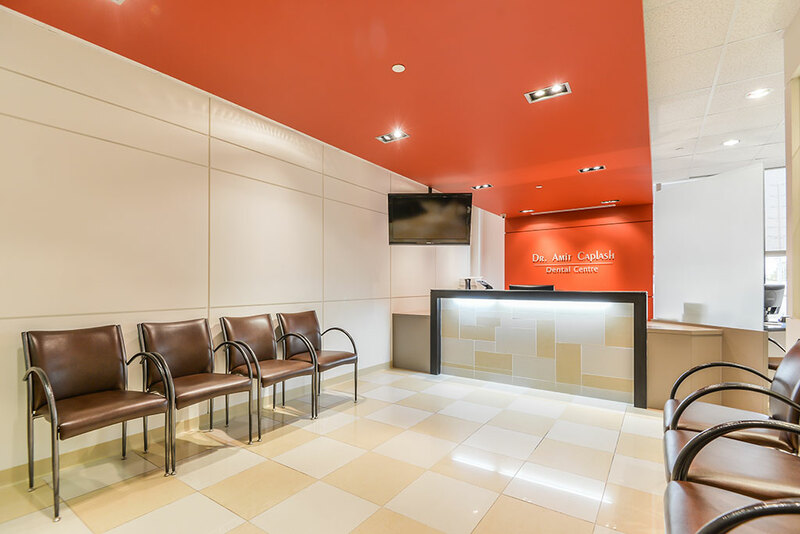 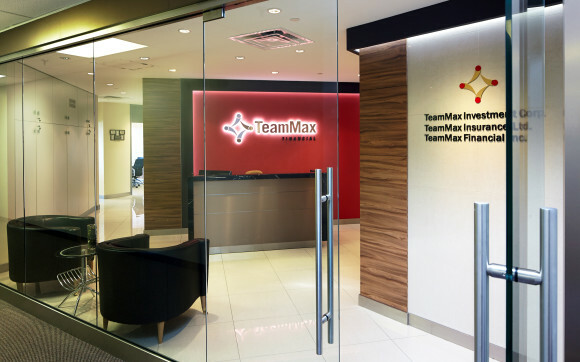 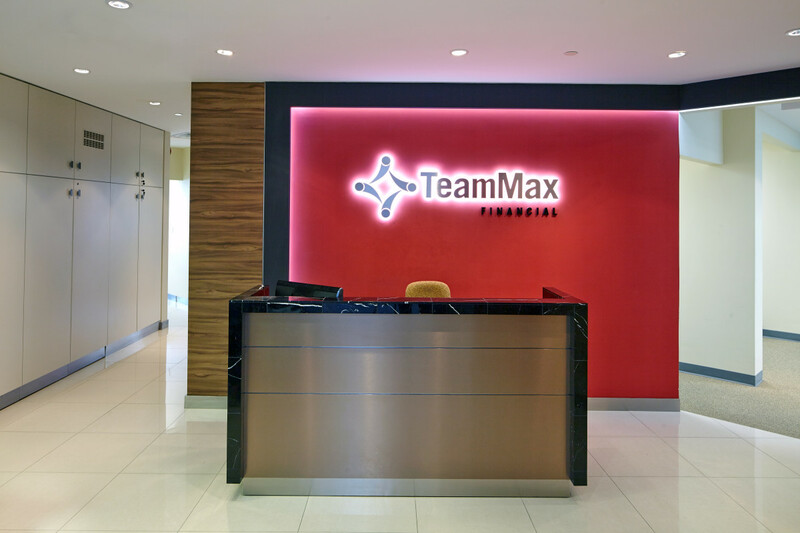 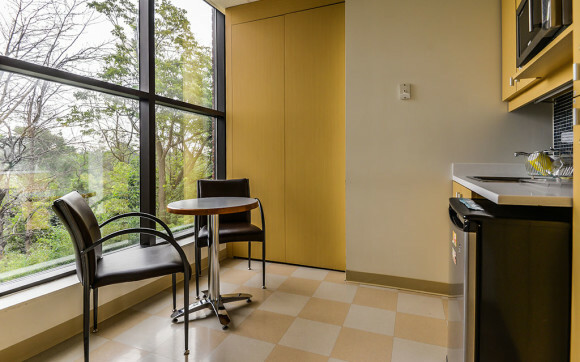 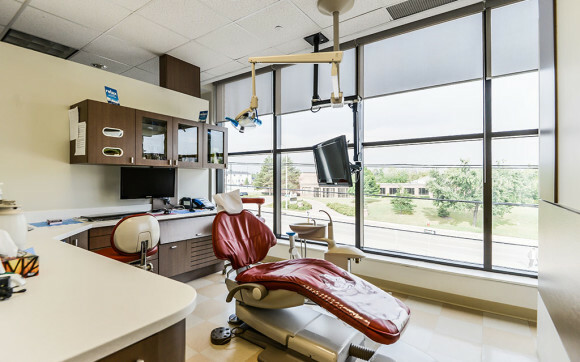 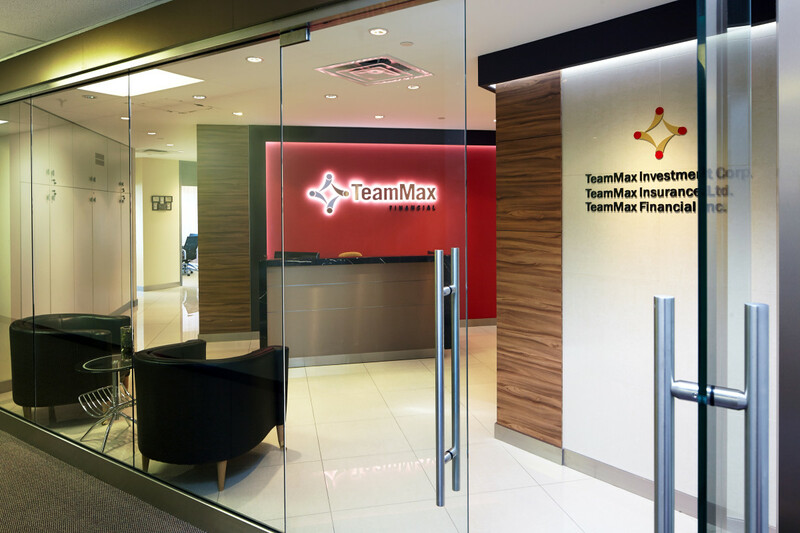 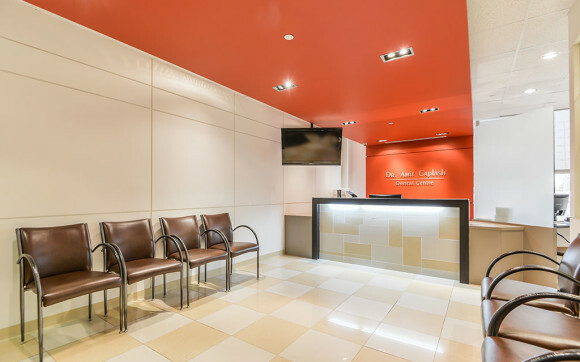 Transforming the traditional dental office experience by creating a dynamic and color rich space that provides a warm and ambient environment. 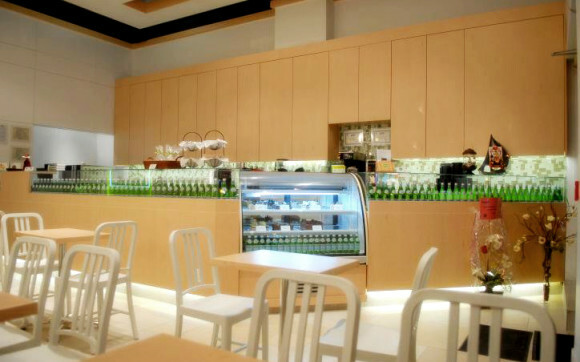 Size: 1,500 S.F. 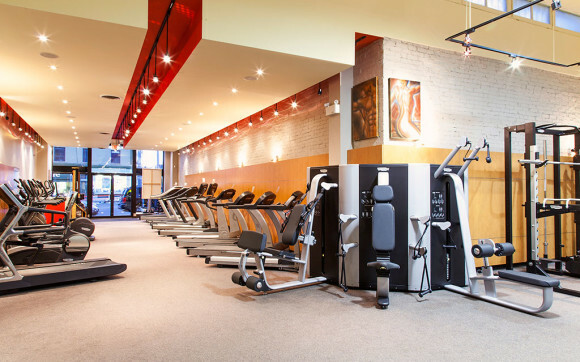 to 3,500 S.F. 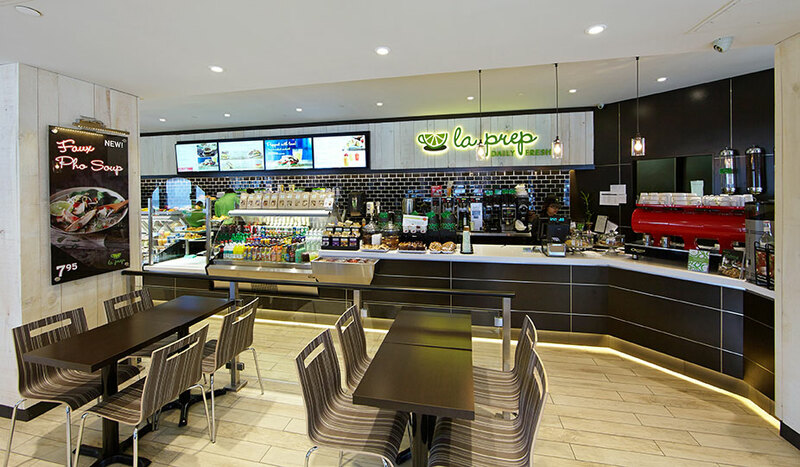 We are incredibly excited to reveal our latest rebrand design for La Prep Canada. 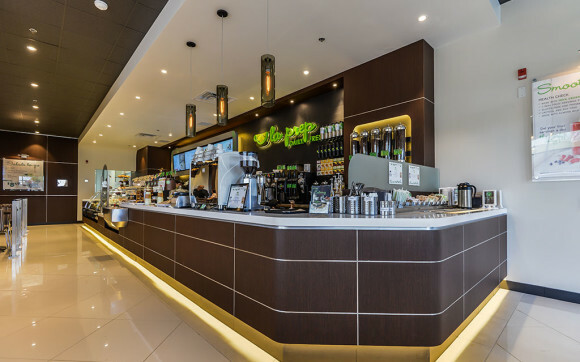 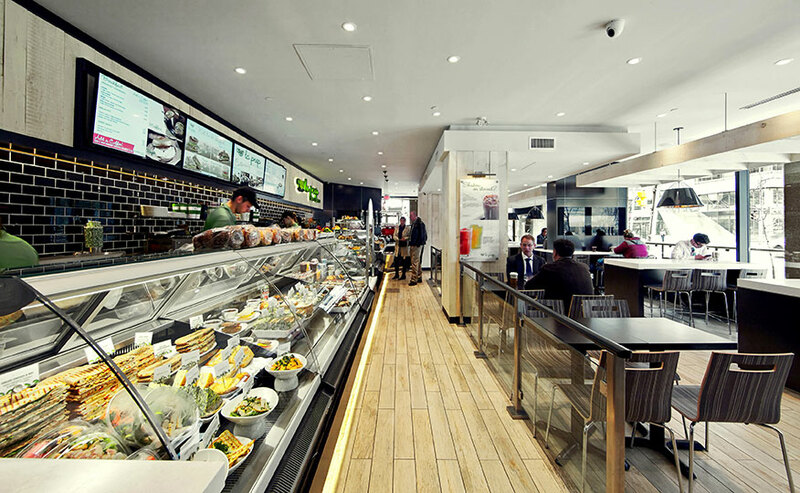 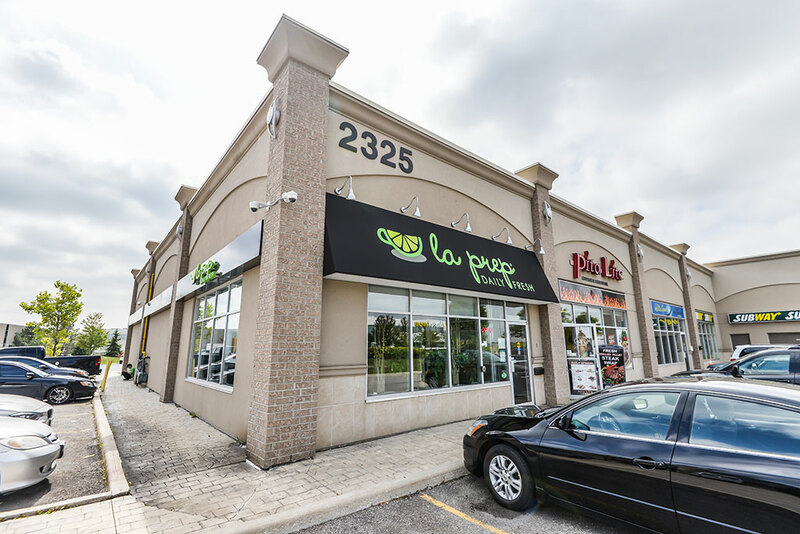 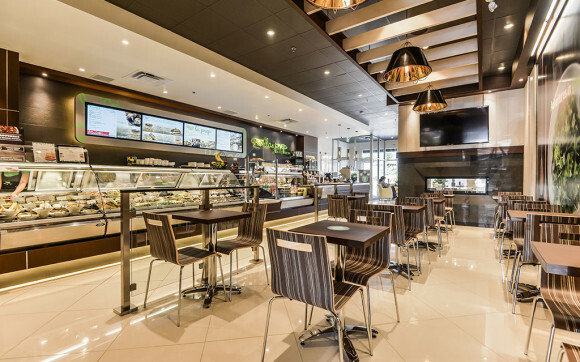 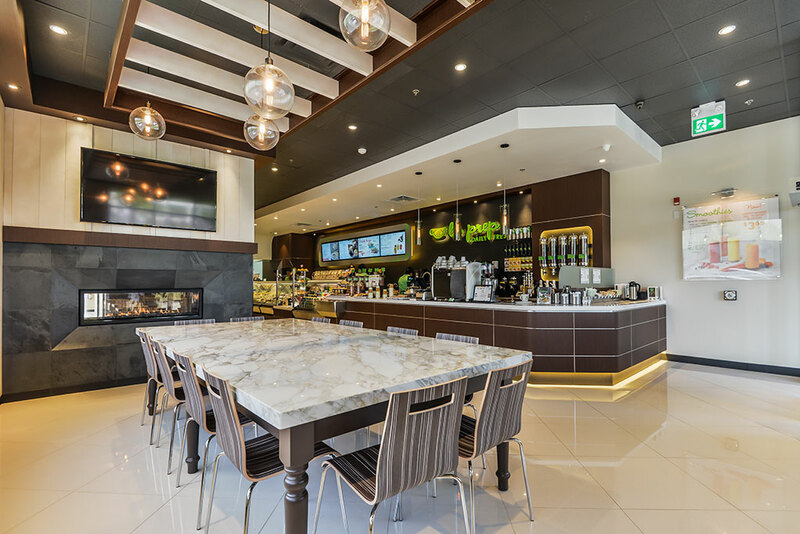 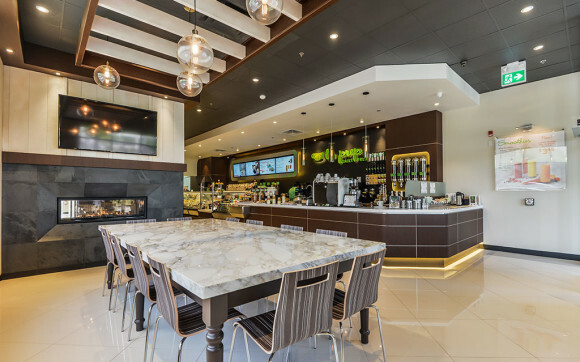 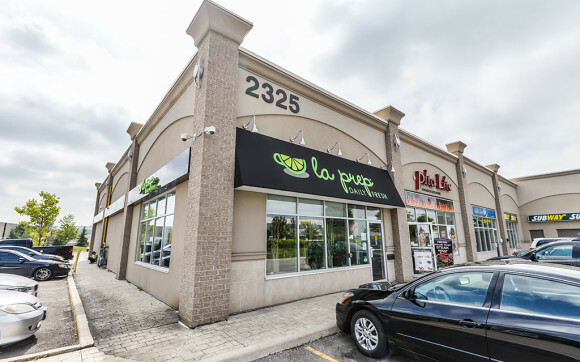 La Prep is an upscale bistro-style quick-service restaurant specializing in freshly prepared innovative sandwiches, hot meals, salads, baked goods and specialty coffees. 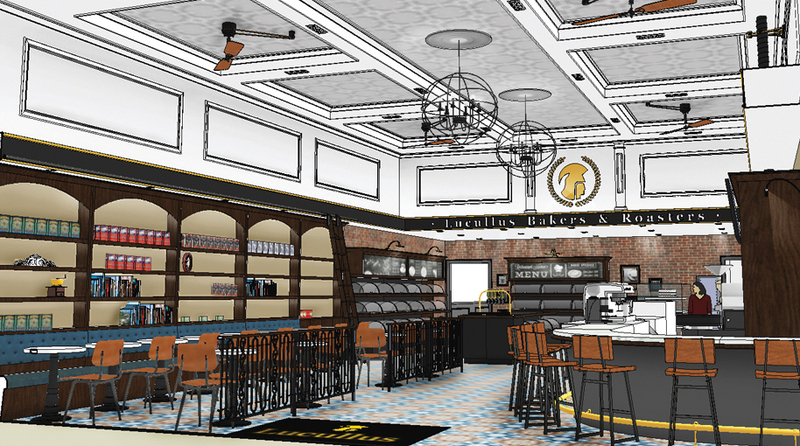 As part of client's rebranding effort, we are also currently working on La Prep Commissary and distribution facility. 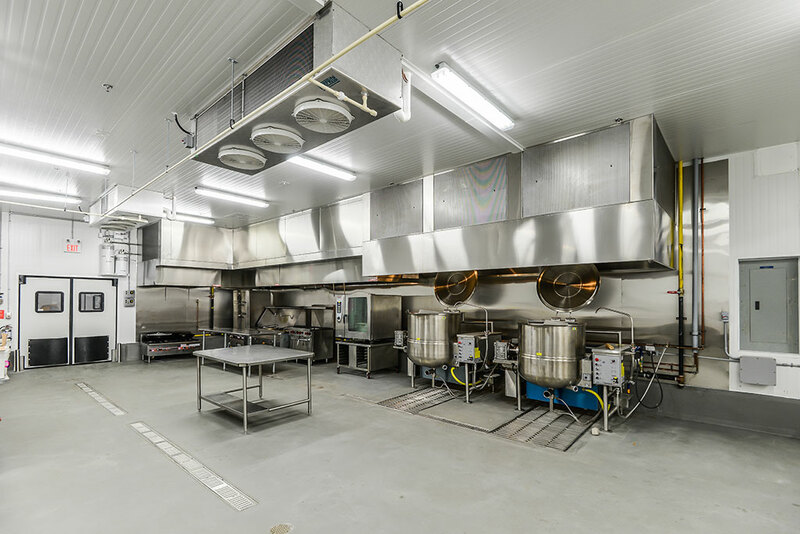 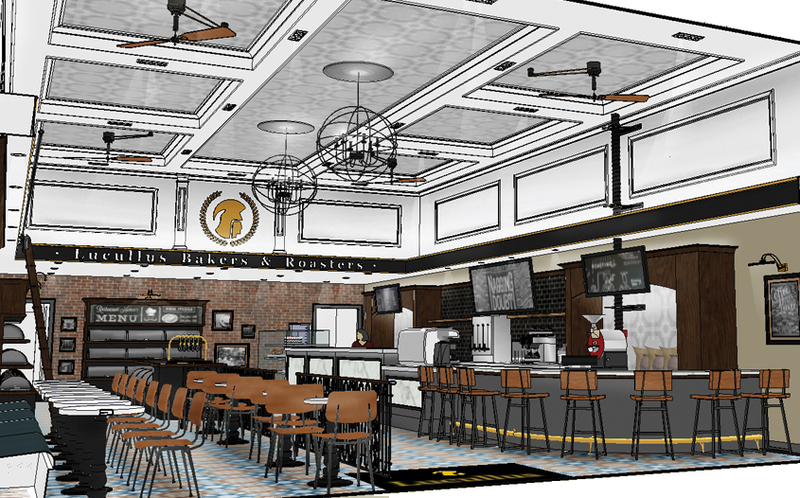 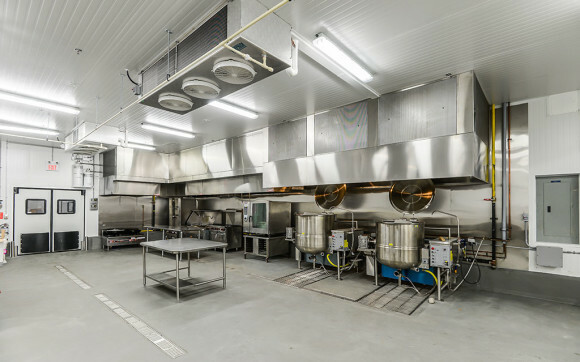 A new 7,500-square foot commissary kitchen. 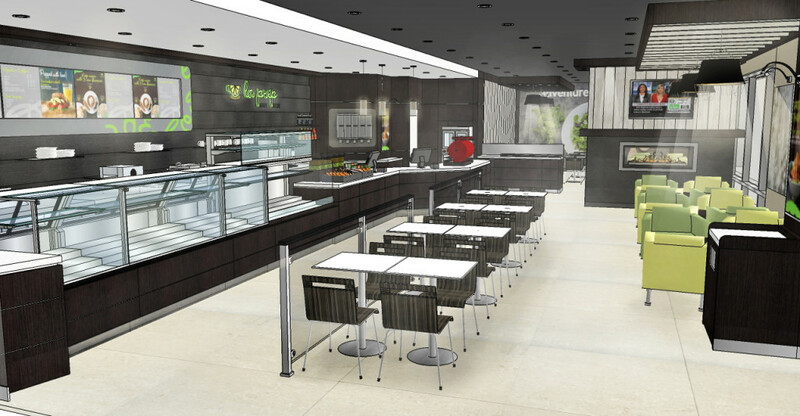 Stay tune for more updates! 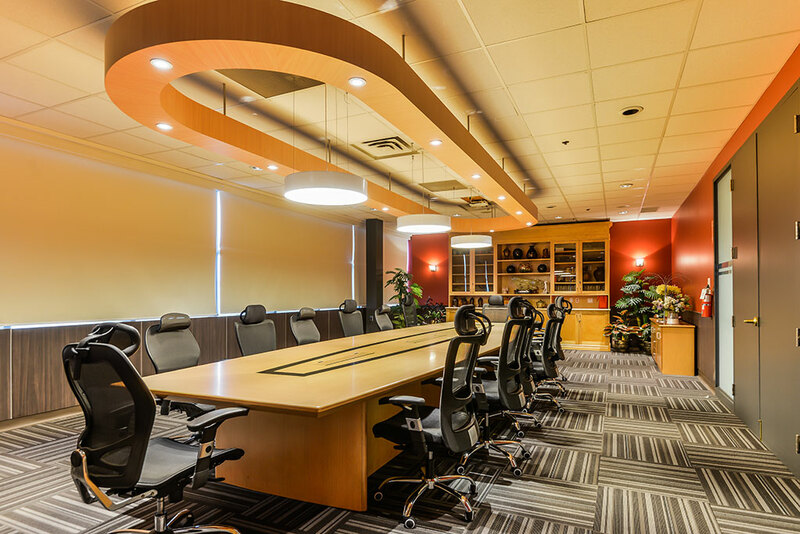 Interior Resources Associates is pleased to announce the launch of our new website. 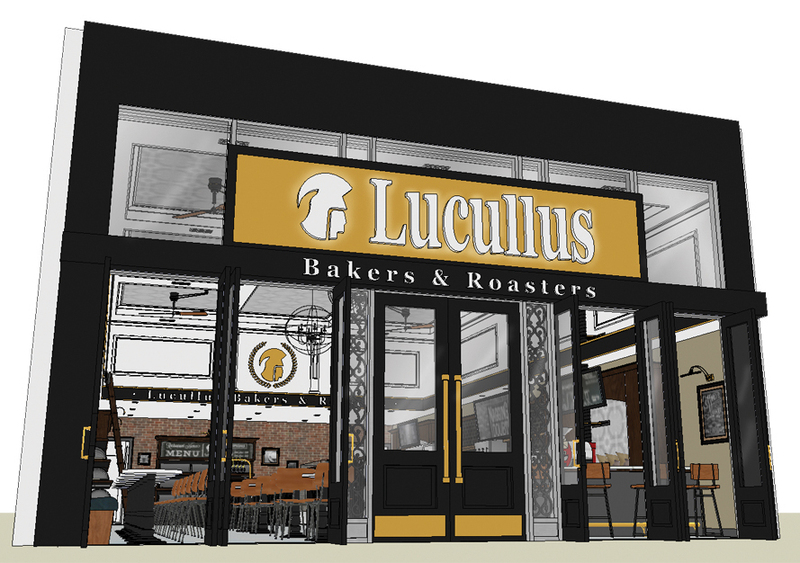 Be sure to follow us on Facebook and stay tune for more exciting projects and news updates! 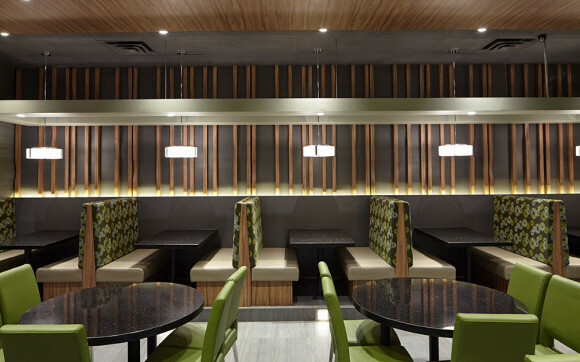 Copyright © interior resources associates inc.